Are you a fan of tiny greenskins? Do you long to deploy swarms of angry little critters? Good news in that case – we’ve laid out Grimtooth’s rules for Snotling herds! That’s another one from the Gorkamorka Heritage Project‘s to-do list! This document was written by Tristån Erickson and with permission was edited by Benjamin Fox and Ross Graham. It’s licensed under a Creative Commons Attribution-Non-Commercial-Share-Alike license. The layout was made by Benjamin Fox using images created by Jenny Mathiasson and is also licensed under a Creative Commons Attribution-NonCommercial-ShareAlike 3.0 Unported license. Occasionally someone ask a question about a document we released a long time ago and one of us digs it up and takes a look to see whether we can remember that far back. These days that tends to result in one more document being added to the refurbishing list. Today’s document is one you’ve seen before – Easy E’s Ork Klan rules. They’re in the new template and look rather swish but other than that they’re unchanged. 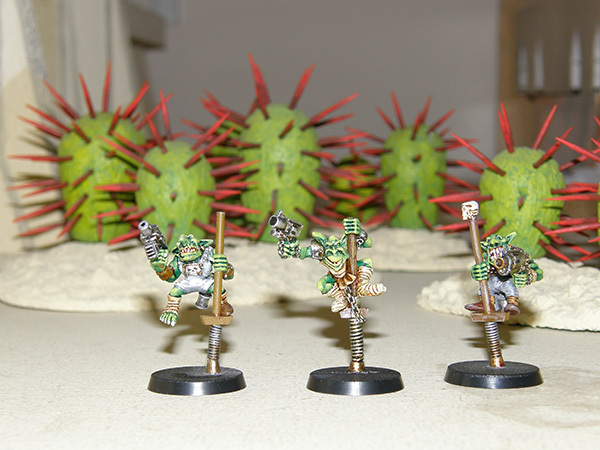 I have been playing ork boyz since they were known as Space Ork Raiders in Rogue Traders days. At first, the orks were a pretty generic “fantasy orc”…IN SPACE! However, the release of Waaagh! Da Orks changed all of that. Suddenly Ork Kulture became relevant as the ork society was fleshed out with glyphs, brewhouses, and oddboyz. 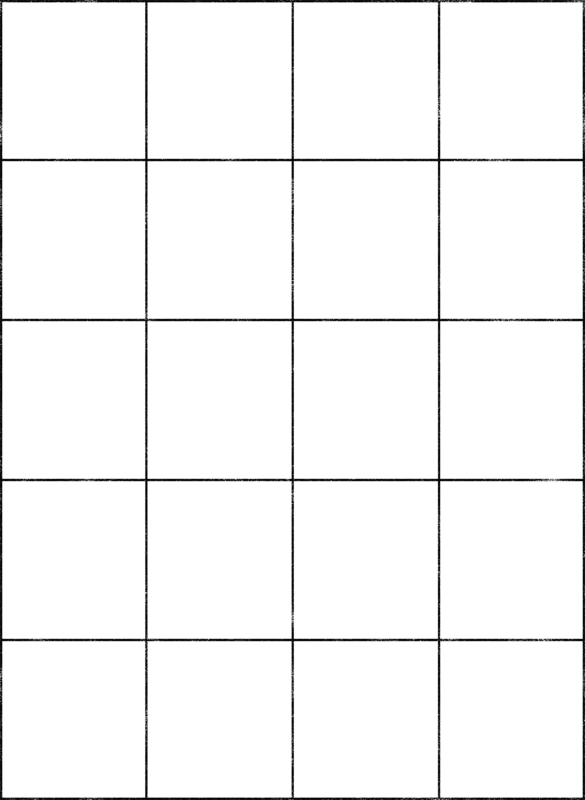 The basics of the background of Gorkamorka were seeded. The ork background continued to expand with such hefty tomes such as Freebooterz and ‘Ere We Go. These books essentially expanded on orks as an army for Warhammer. The Klan system had originally been introduced in Waaagh! Da Orks, but had been explored in much more depth in these later books. 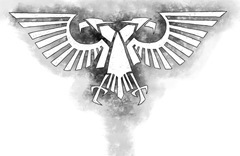 When third edition 40K rolled out, the orks moved away from the Klan system in their codex, but Andy Chambers himself decided to tackle making some Klan specific rules for Chapter Approved. 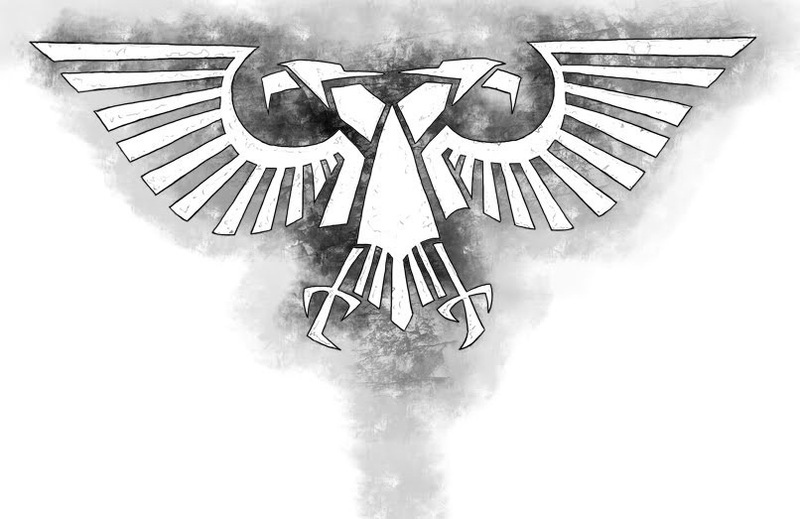 Gorkamorka was released at the end of Warhammer 40K Second Edition when Klans were still in full swing and part of the Ork Second Edition codex. I always felt that leaving the Klans out of Gorkamorka was a huge miss, since they had been an established part of the background for so long previously. The idea of Gorkers and Morkers as the only Ork gang types within the Gorkamorka rules set always concerned me. I was also an avid Necromunda player. I enjoyed the unique and varied background of the Hive Primus gangs. It provided a bit of flavor that Gorkamorka lacked. 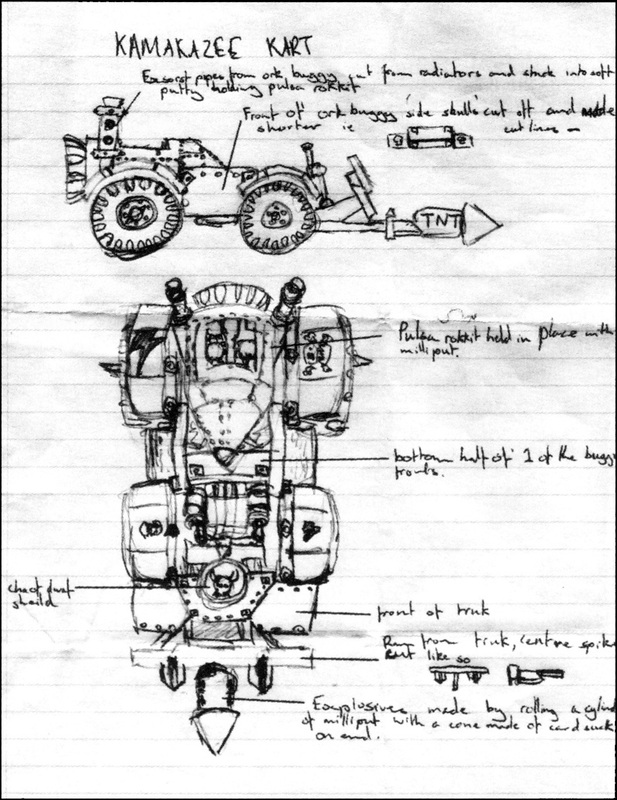 Again, I was surprised Gorkamorka did not use a similar system, only based on the ork Klans. 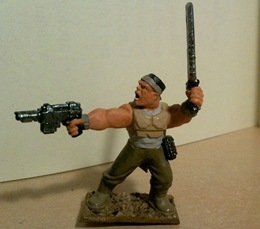 The only downfall of the Necromunda system, was that starting gangs had very few differences. Again, this is something I felt was a drawback. Therefore, when I tackled doing some additional rules for Gorkamorka, it seemed logical to focus on the two aspects of the game I felt were lacking; Klans and gang differentiation. Almost all of the rules here are based on background or rules from previous versions or imaginings of ork klans that came before. Bad Moonz teef naturally grew faster, so they were wealthier. Deathskullz were the best Lootas, painted themselves blue for luck, and made heavy use of Gretchin. Goffs were dead hard fighters, with a lot of nobs. Whenever you make new rules, potential balance issues arise. The important thing to remember is that no game system is perfect, especially one with as many moving parts as Gorkamorka. No matter what a game designer does, players will find a way to exploit it. Fact. So, like all rules, these will need you and your game group to decide what works, what doesn’t, and where the tweaks need to be. Thankfully, Gorkamorka is a cooperative wargame not set up for tournament play. That should leave plenty of scope for you to use Klans in your games and have a good time sticking in the boot. This document was written by Eric Farrington. It’s licensed under a Creative Commons Attribution-Non-Commercial-Share-Alike license. The layout was made by Benjamin Fox using images created by Jenny Mathiasson and is also licensed under a Creative Commons Attribution-NonCommercial-ShareAlike 3.0 Unported license. 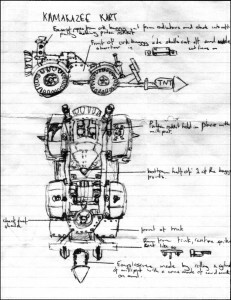 We’ve laid these rules out as part of the Gorkamorka Heritage Project. There’s a tag here on tUGS for documents released as part of it in case you’re interested to see what else has come out of it so far. There’s quite a lot of documents we’re still trying to reach the authors of (how many of you still have the same email addresses you had in the late 1990s!). Check out one of the forum threads that Flamekebab has created about the project to learn more – The Waaagh, Specialist Games, DakkaDakka. This document was written by Aris Tottle and was edited by Liam Davenport, Benjamin Fox, and Ross Graham. It’s licensed under a Creative Commons Attribution-Non-Commercial-Share-Alike license. The layout was made by Benjamin Fox using images created by Jenny Mathiasson and is also licensed under a Creative Commons Attribution-NonCommercial-ShareAlike 3.0 Unported license. Gubbinz contained a fairly mixed bag of new content but this article arguably brings the most advanced stuff to the table. It’s a bridge between Gorkamorka and Necromunda, merging Necromundan gangs into the world of Gorkamorka. It was written by Colin Stutt and by the looks of it quite a lot of thought went into it. Arguably the most game-changing concept that carries over is the concept of Heavies. 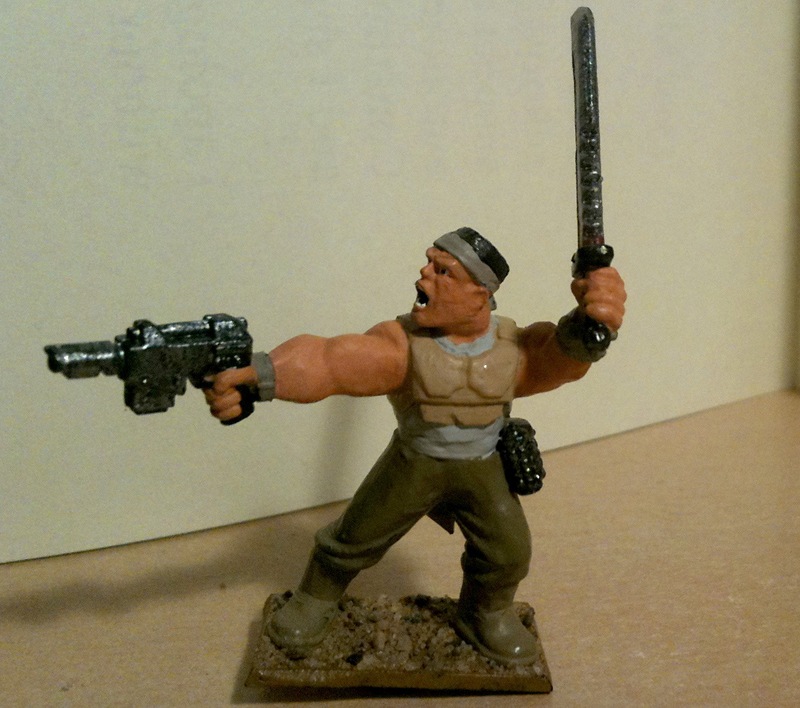 In Necromunda shooting is much more deadly and the arsenal available can be downright dastardly – not so much in Gorkamorka! Being able to bring things like lascannons to the table could well change the game dynamics substantially. 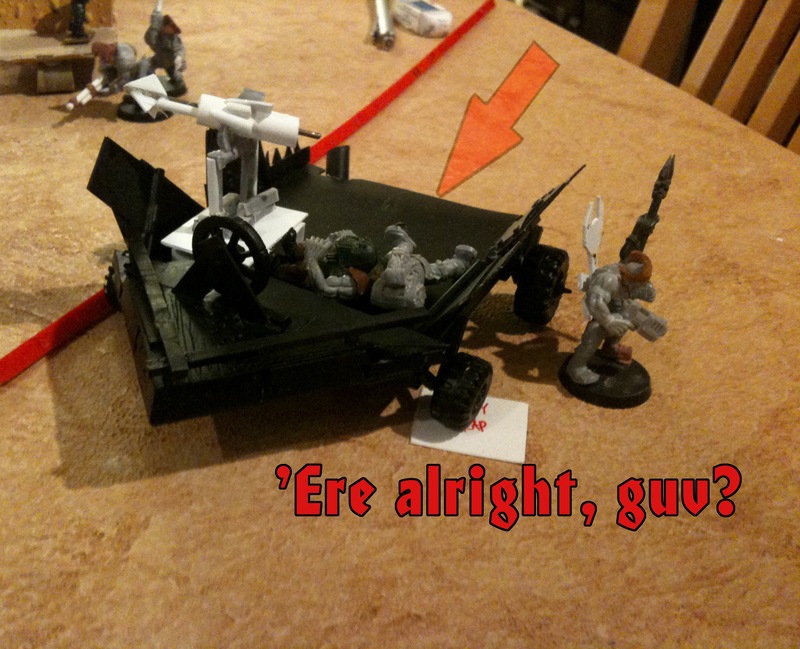 It’s probably not wise to be in the open when testing the idea though – getting run over by a trukk full of Orks tends to ruin a warrior’s day! Ah the 1990s. No, don’t look at the photos, just, don’t. Oh all right then, let’s brace ourselves and drift back to that glorious time when the Spice Girls were in the charts and yo-yos and rollerblades were the coolest things ever. It was awkward but we had a lot of fun. We’re continuing to clear out the Gubbinz backlog today with something for Rebel Grots written by Barry Thompson. They seem to basically be miniaturised versions of standard Rebel Grot cuttas. Getting one article published in the old Black Library publications was something to brag about but two, well, that’s an elite club. Sadly none of us here at tUGS can lay claim to that honour. Stefan Fergus can though! 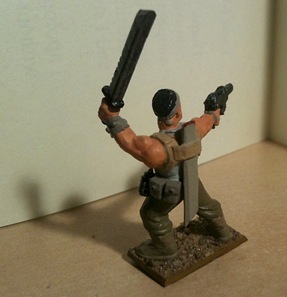 Here’s his second article, Rebel Grot Pogo Stikks. If you missed the last one it was rules for Rokkit Paks. Quite a fan of double Ks, wasn’t he? Obviously one is the easy conversion of a Bloodbowl figure as suggested I think in the pogo stikk article in Gubbinz 1. 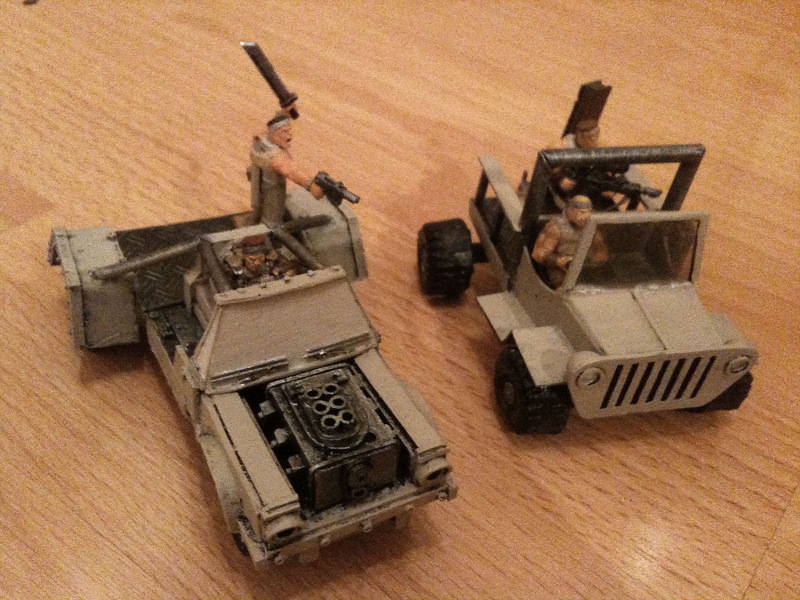 The other 2 are scratch-built pogo stikks – made of thin plastic rod with wire wrapped around the base to make a spring and a cross-piece out of square-section rod. I used some old plastic Warhammer goblins and added the odd pistol and some stikk bombs (the very old small grenades off the first plastic orks from long before Gorkamorka). Pretty easy really. If YakTribe is going to be supporting Gorkamorka soon we’d better get a move on clearing out the old stuff from the archives! This one is also from Gubbinz #1 and was written by Stefan Fergus. They’re the only rules approximating stormboyz GW ever published for Gorkamorka but not the only ones out there. They look fun in concept but paying D6 teef to repair them between games seems a bit on the harsh side. When it comes to Gorkamorka there’s something that’s often overlooked – it wasn’t only released in English. We’re not sure how many languages were supported but so far the list runs to French, German (Thanks, Morx! ), Italian, and Spanish. Flamekebab even has a copy of “Skavanob” kicking around apparently! Thanks to Da Bikers over on The Waaagh there’s a new version of the Gorkamorka Outlaw MC PDF. The rules are identical but now there’s some really awesome artwork. I’m a bit of a fan of the show Sons of Anarchy, as I know some of you are too. Well one thing led to another and this logo came about. Thank you so much, Darren, it’s bloody brilliant. If you’ve not seen the SoA logo before it looks like this. The old version can be found here, should you be interested. These rules are licensed under a Creative Commons Attribution-Non-Commercial-Share-Alike license. The rules were written by Ben Fox with additional work by Liam Davenport. The layout graphics were created by Ben Fox and are licensed under a Creative Commons Attribution-Non-Commercial-Share-Alike license. The illustrations were provided by Darren Sampson and are licensed under a Creative Commons Attribution-ShareAlike 3.0 Unported License. 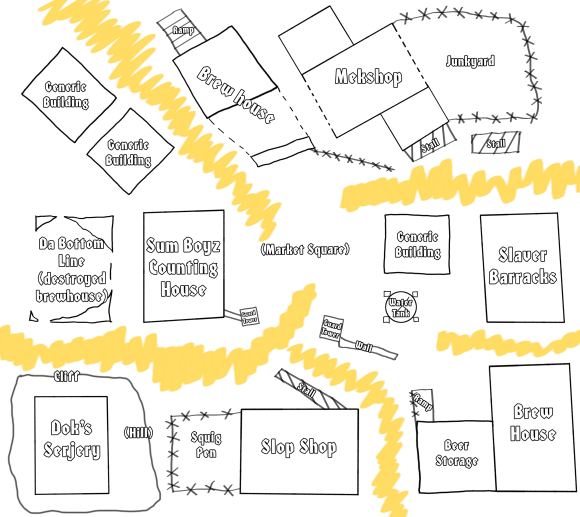 Before we go into scenarios for Da Town and the extra rules which exist you first need to understand a little about map layout. You’ve no doubt seen some photos of our buildings under construction but I don’t know if you realised that they were built to a careful plan. We could of course just create whatever shape of buildings we felt like but that could lead to some fairly unbalanced games. Instead we planned out a layout that would provide a nice mix of cover, bottlenecks, elevation, and general chaos. The idea here was to ensure that there was at least three routes into or out of the square for vehicles. If a mob is trying to get in, or defend the area, there’s not just a single way in, forcing the players to spread their forces out. 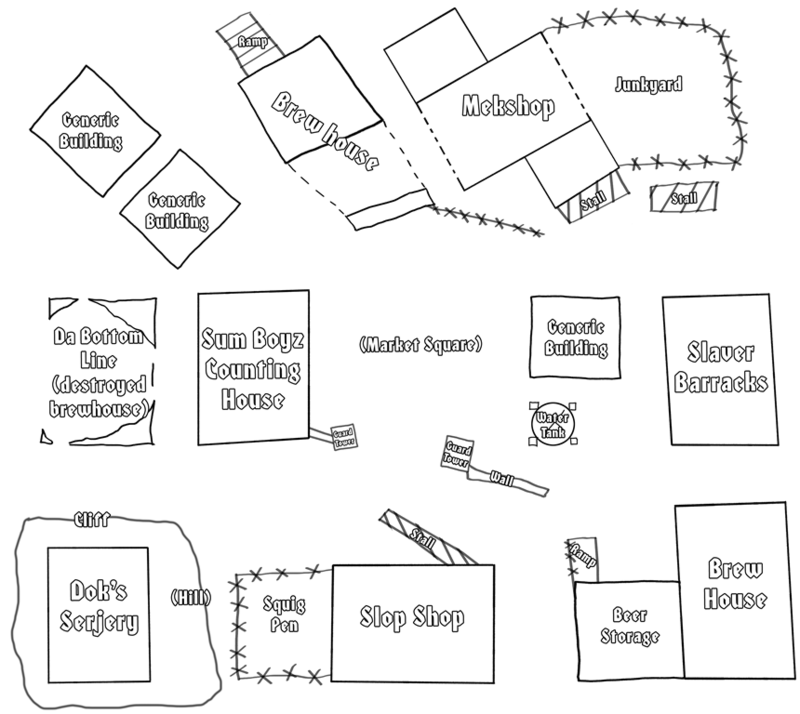 The mekshop and brew house are not highlighted above as they don’t lead anywhere. In actuality they have arches allowing a vehicle to drive right through them, also handy as a deployment location for a scenario. As you can see, mounted warriors have a bit of an extra advantage here. Foot models can of course also use these routes but they don’t have the speed that mounts confer. Returning to the main map there’s a the verticality aspect of things. 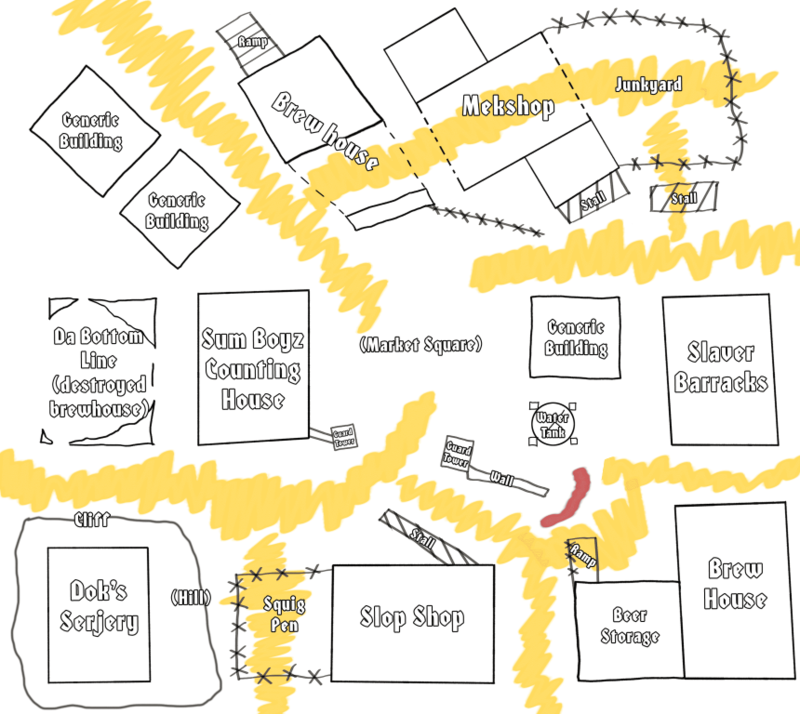 Instead of the mostly flat plain that Gorkamorka is normally played on one instead has alleys, roof tops, and interconnected roof top escape routes. These walkways aren’t illustrated on the map as we tend to change them each game to keep things fresh. Some of the larger ones can also be traversed by mounts, allowing one to rain fire down from the roof tops. There’s nothing like a biker chasing a warrior throwing stikkbombs down on him! The Dok’s serjery is on a relatively tall hill, creating a vantage point for warriors with decent ranged weaponry such as Muties, Diggas with archeotek gunz, and Dust Rats. On the other side of the map there’s the two storey slaver barracks, the mek shop, and the brew houses. Sluggas and six shootas can be handy in an alley but there’s something delightful about catching a warrior out in the open at range! Next we’ll be providing the tiered rule sets for Da Town but in the mean time you should have a bit of a think about your town design. Hello folks! 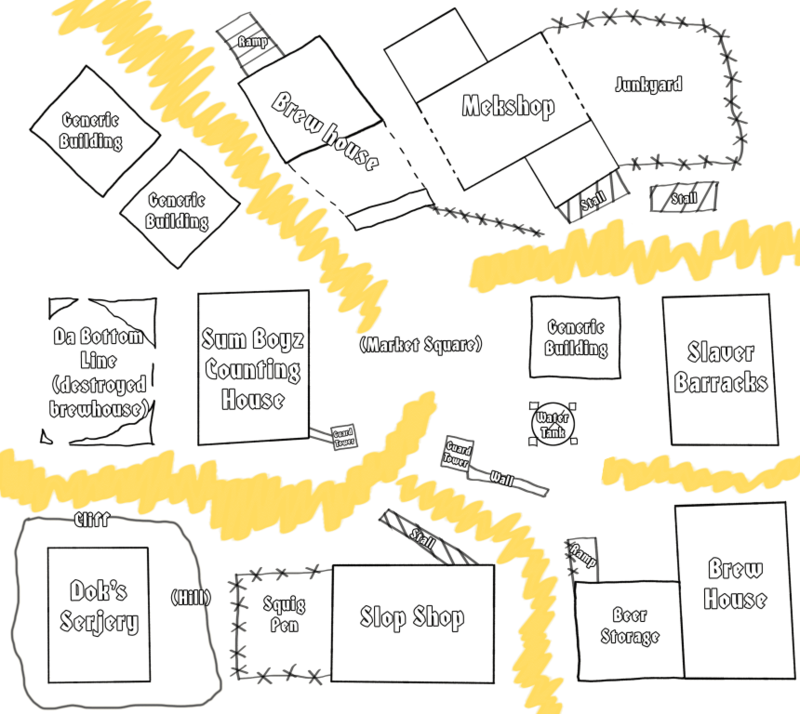 Here’s a little bit of fiction that describes how Da Town came to be. It’s a little haven for the freaks of Orkoid society who don’t quite fit in even by the weirdness of a large Orky encampment. Each of the named characters in where will hopefully acquire a mini-campaign suited to their profession in the future. These scenarios could also be inserted into a larger campaign and will include some which can be run “solo” to help mobs that are falling drastically behind possibly make up the ground in experience or teef. There will also be some special items only obtainable as a result of these scenarios that I’ve got in the back of my mind. So without further ado…! Once upon a time a few years back, an ambitious young Mekboy by the name of Brazzop went out looking for scrap and found a doozy of a pile. Rather than share it out and put it towards the construction of Gorkamorka, the Mek hatched a cunnin’ plan. He built his workshop around the scrap and gained a reputation for making quality vehicle gubbinz, using his superior pile of scrap to make them da shootiest and da loudest. As a result, a small town grew up around the workshop away from the eyes of the Big Mekz and their unerring devotion to Gorkamorka. First came the brewhouses, one each for Gork and Mork, as Orks are a deeply religious people and can’t be drinking in a pub that isn’t in favour with their Godz. 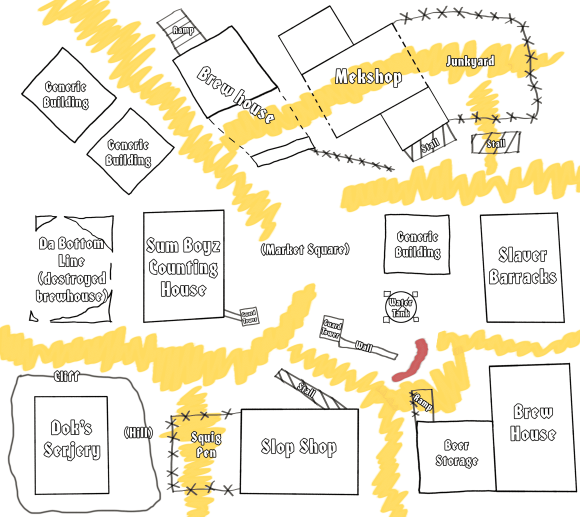 Then came Cookie who reasoned that Orks who were waiting for vehicle repairs and drinking in the pubs would need some top quality grub to keep them ready for the fightin’ of the day and built a slop shop. Cookie knows fine Orky food and keeps a small squig pen where he breeds the special ingredients that are rare in Mektown and can only be afforded by the very richest and most iron stomached of Nobz. Once a week when there’s a caravan headed to Mektown, he sends one of his boyz to pick up the essentials and sell on any spare exotic squingredients he has. Dok Biskap has a small serjery on the hillside where he tends to those who survive the pub brawls and those who are a bit more reckless with their personal health. He left Mektown in rather a hurry after an unfortunate incident involving a Kustom Thrusta Boosta being attached to the mouth of a Nob who was less than pleased about its location. Of course, due to the placement of the boosta, the nob hasn’t actually managed to tell anyone who did it to him without it being drowned out in a blaze of flames and smoke but the Dok felt it was time for him to move on and avoid any unnecessary bad press. Of course, it’s a dangerous place to set up shop out in the sand without the protection of the walls that surround Mektown with sandscorpions, Mutie raiders and curious Dust Rats poking around all over the place so life is a little more fraught out here. A small cadre of retired Orkz act as town guards though they’re more concerned with filling their faces in the slop shop than maintaining order. They know all the legends and rumours about what goes on in the desert and can still hold their own in any given fight. Often the threat of their jackboots being stuck somewhere unpleasant is enough to dissuade the less reckless from starting any big trouble in the town. Add to that the bonus that the Big Meks aren’t actually watching what you are doing and suddenly Da Town opens up a whole load of possibilities for Boyz who can think Big! 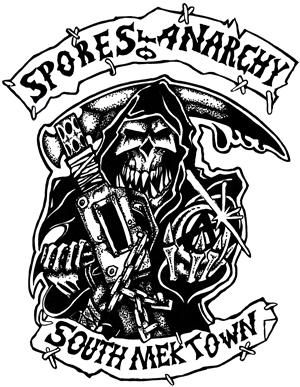 Da Town also acts as a haven for Freebootaz, Bikerz and other outcasts of Orky society. While mobz loyal to the Big Mekz also frequent the area, there’s no real reason to start a proper rumble unless there’s a real profit to be made. And all the real profit is made by one particular ork, Abak Manyfingaz! Will these Orks change the course of history on Angelis? When are Biskaps disgruntled patients going to catch up with him? Is Brazzop in for a kicking from boyz sent by the Big Mekz? And who is Abak Manyfingaz? Keep a bionik eye out folks! Happy Orktober one and all! We’d not forgotten, whatever you ‘orrible lot might think. We’ve got some fun stuff in store for you this month that should keep GoMo nice and fresh. We’ll not be posting stuff every day like last year as we’re a bit too busy with our own lives for that, however we do plan to give you a whole load of content starting today. 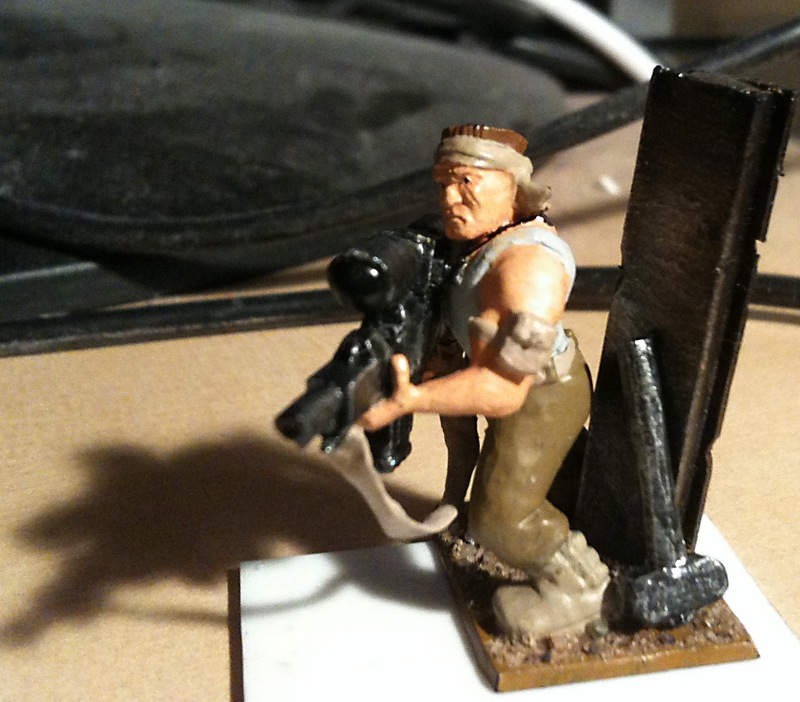 Flamekebab has been scribbling away at some simple but effective rules for Freebooter Snazzguns. Clayton humoured the daft git with some rather tasty artwork too so check out the document below. This document was written by Benjamin Fox and contains artwork created by Clayton Tait. It’s licensed under a Creative Commons Attribution-ShareAlike 3.0 Unported License. UPDATE: A new version of these rules has been released. Hey guys, Flamekebab here. I’ve been rather enjoying a particular TV show from the US of late and it inspired me to try to create a biker mob. In the past there’s been discussion of how to use bikers in Gorkamorka both on tUGS and in the community, but I never quite found something that appealed to me. Playing the DLC for GTA IV, The Lost and Damned, made me enjoy bikes in a way I hadn’t before and where better to express that than on the battlefield that is Da Skid? These rules are based on the Freeboota rules written by Neal Plews but are significantly different. They also introduce a hired gun of sorts, much like Underhive Scummers in Necromunda. Unlike the other factions I’ve worked on with the rest of the tUGS team this one is just a small one, not a fully-fledged jobbie with countless hours of playtesting to its name and won’t be going in Ere Be Stuff. Actually, it hasn’t been tested at all yet, but I wrote them for my own use in our upcoming GoMo campaign so I’ll do my best to post feedback and then later tweak the rules if necessary. Either way, I hope you enjoy these rules and let us know what you think. I’ll do my best to get some nice models and a few battle reports if I can. 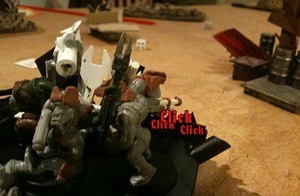 I’m thinking the Feral Ork torsos from Kromlech with leather biker cuts sculpted on. These rules are licensed under a Creative Commons Attribution-Non-Commercial-Share-Alike license. The rules were written by Ben Fox with additional work by Liam Davenport. The layout graphics were created by Ben Fox and are licensed under a Creative Commons Attribution-Non-Commercial-Share-Alike license.The illustration was provided by Darren Sampson and is licensed under a Creative Commons Attribution-ShareAlike 3.0 Unported License. 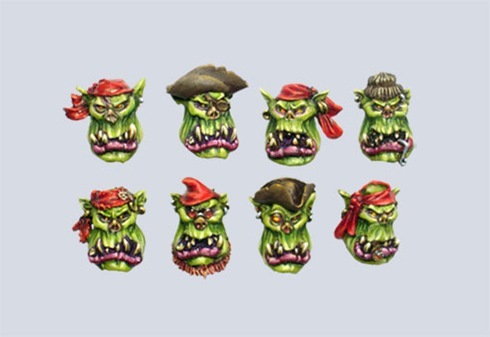 Just like with the Dust Rats, feedback on the Feral Ork rules can go in the comments, or over on the relevant topic on The Waaagh. If you want quick links to the individual components of this PDF you can head over to the summary post. This document was written by Liam Davenport, Benjamin Fox, Ross Graham, and Matt McPherson. It’s licensed under a Creative Commons Attribution-Non-Commercial-Share-Alike license. The layout graphics were created by Benjamin Fox. 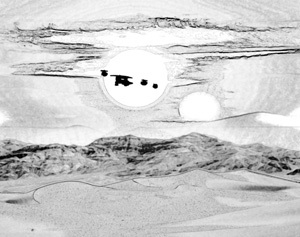 The artwork above was created by Clayton Tait. Yes, it may seem a bit crazy, but we’ve just published just about everything for The Feral Orks. They’re beta rules, of course, but we’ve done our best to test them out; Skippy and Flamekebab have been running weekly tests sometimes with the help of Mattzm and Depiff. The complete PDF is done now and you can get it here. There will be a PDF soon. Flamekebab is being dragged from his lair as we speak to be put to work in the DTP mine. With any luck they’ll be done by early next week. In the meantime this post should make it easier to find what you’re looking for. In a Feral Ork mob it comes down to who is the biggest and toughest to lead, regardless of smarts, planz, or any other clever stuff. Feral Orks know where they stand when it comes to being da ‘ardest and so if a Wildboy ends significantly ‘Arder than the mob’s current Brute, he’s going to make it clear who the new boss is. If a Wildboy’s Strength and Toughness characteristics exceed those of the current mob leader a leadership challenge will occur at the earliest opportunity, as per the Pit Fights rules on page 66 of Da Uvver Book. Ignore results of Shooty in the restrictions table on page 67 of Da Uvver Book, instead treat a roll of 1, 2, or 3 as Cunnin’ and a roll of 4+ as ‘Ard. Only Wildboyz will ever challenge the Brute as Fickies are too thick to try and the Weirdboy has enough on his plate summoning the powers of the beyond! Feral Orks may be dimmer than most but they still know an important job when they see it and firing the Spika Cannon or telling the Squiggoth where to go is a coveted position, sometimes carrying with it extra yummies if they do well. As a result, Driver and Gunner disputes are resolved just like any other Ork mob (See "Slop Shops and Brewhouses", page 66 of Da Uvver Book). Just as with normal mobs, if a Feral Ork dies all of his equipment is lost and cannot be re-allocated to another model (see "Death of a Warrior", page 68 of Da Uvver Book). Sometimes the bigger they are, the harder they fall and they don’t come much bigger than the Brutes. When a Brute dies as a result of battle, the pecking order is almost immediately re-established. Add the Strength and Toughness of each Wildboy together and the one with the highest total number is designated the new Brute. In the event of a tie resolve a leadership challenge as detailed above. If there are no Wildboyz in the mob then you must hire one at the earliest opportunity. Feral Orks will never pay or accept a ransom but will exchange captives. Should that not be an option one rescue attempt may be made but if it fails then the warrior is killed and all equipment lost. Feral Orks cannot make use of any weapons or equipment a captive had but they don’t go hungry either, which is represented by some extra income from the captive. Muties and their mount have plenty of meat on them and earn a mob 2D6 teef, Orks are provide D6 teef of yummies, as do tasty Diggas and Dust Rats, Grots are only worth D3 teef, and Snots are nothing but a mouthful and so give nothing. 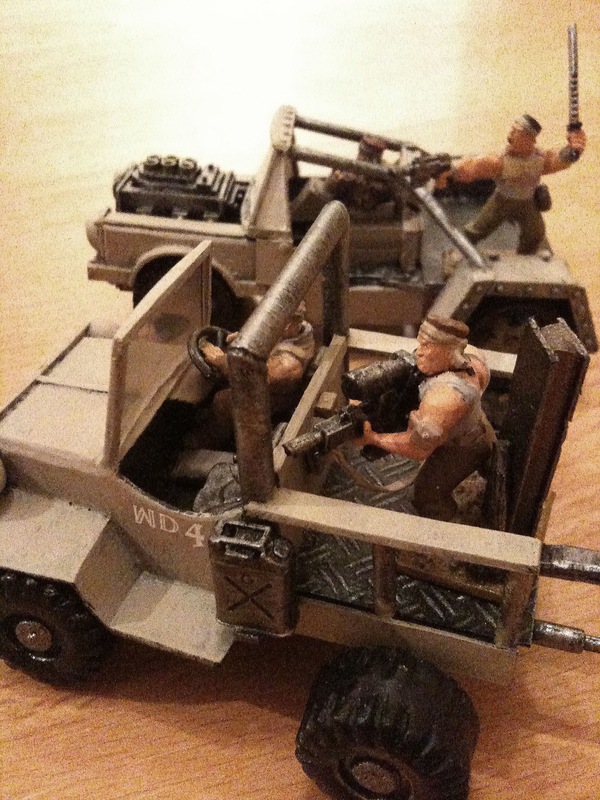 Captured vehicles cannot be eaten, although one or two fickies are bound to try, but the shiny parts can be bartered with other Feral Orks for 3D6 teef. As previously mentioned, Feral Orks will exchange captives but cannot pay ransoms and must instead play a rescue scenario. As with normal mobs, equipment captured with a warrior who is not exchanged may be kept and used by the capturing mob, with the exception of Brute equipment (Big Hamma and Iron Hide). Feral Orks can be forced to work in mines but will only ever generate D3 teef each. Squiggoths/Squig mounts captured by enemies behave as if they were vehicles in terms of selling them off for scrap as they provide a nice slab of squig meat for those in desperate need of some munchin’ (see page 54 of Da Uvver Book). Underdog bonuses and Experience bonuses apply as normal for Feral Orks. The table below indicates when a Feral Ork has earned enough experience to roll on the Feral Ork Advance Table, or Fickie Advance Table. Starting level for Wildboyz. Fickies who reach this level gain +1 Toughness. Warriors who reach this level may not advance any further. 2 Know-wots. Choose any of the skill tables and randomly generate a skill from it. 3-4 Know-wots. Select one of the standard skill tables for the mob and randomly generate a skill from it. 10-11 Know-wots. Select one of the standard skill tables for the mob and randomly generate a skill from it. 12 Know-wots. Choose any of the skill tables and randomly generate a skill from it. 2 Late Bloomer This particular Fickie isn’t quite as dense as his brethren and the repeated kicks to the head have finally got his brain up to speed. The Fickie becomes a Wildboy and behaves as one from now on, including for future advances. 3-4 Small Victories After many days of toil the Fickie has at last learnt something. Admittedly it might be the difference between day time and sleep time, but he’s improving. The Fickie gains no advance. 10-11 Small Victories After many days of toil the Fickie has at last learnt something. Admittedly it might be the difference between day time and sleep time, but he’s improving. The Fickie gains no advance. 12 Late Bloomer This particular Fickie isn’t quite as dense as his brethren and the repeated kicks to the head have finally got his brain up to speed. The Fickie becomes a Wildboy and behaves as one from now on, including for future advances. The maximum characteristics for any Feral Ork warrior are listed below. Should an advance raise the stat above its maximum, the other option must be taken instead. If both stats are already at their maximum then one other may be raised by 1, as per the normal advance rules on page 58 of Da Uvver Book. The chart below details which skill tables different Feral Orks may normally roll on should they get a Know-wots result on the advance table. Feral Orks can never, under any circumstances, gain Cunnin’ skills. As stated previously, Fickies do not gain skills. Re-roll results of Bomber on the Dakka skill table and Tinkerer on the Odd table. These special Feral Skills allow the brightest of Feral Orks to find a niche in the mob. Hunta-Gavara – Boyz with this skill will add an extra D6 to their income rolls. Yella – There’s a good set of pipes on this boy! The warrior can also contribute a Leadership roll to prevent Animosity from occurring. When rolling, roll the Brute (or leading Ork) as normal and then roll the Yella. If the Yella’s result is better, use it, if not, ignore the result. Brutes with this skill may roll twice and choose the best result. Opposable Thumbz – The warrior has quite the knack for finding handholds when climbing. He may re-roll a failed initiative test when attempting to board a vehicle. Squig Whispera – The model gains +1 to his Leadership for rolls to prevent Squiggly Beasts going out of control. Ceremonial Mutilation – The Warrior is covered in ritualistic scars and has carved bone fragments protruding from various parts of his head. His bizarre appearance causes Fear. 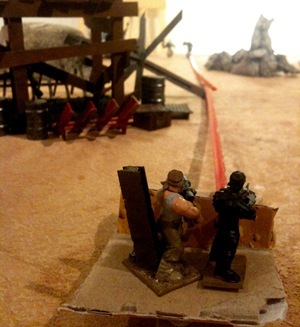 Knuckle Under – The Ork moves like a large gorilla, knuckling across the terrain. Any hit or shot made against him has a 6+ unmodifiable save to account for his odd movement style. Weirdboyz can roll on the Waaagh!! skill table in place of another skill table. Roll a D6 to determine which power a Weirdboy gains. See the Weirdboyz section. After a battle Feral Orks gather yummies and shinies, look after their Squigs, and so forth. Brutes boss others around, Weirdboys, well, it’s best not to ask, and the rest make sure the mob eats. Each Wildboy and Fickie that doesn’t suffer a serious injury in the preceding battle may forage. Wildboyz earn D6 teef whereas Fickies only earn D3 teef, although what they’re getting is only measured in teef for player convenience (Much like with Muties). Once total income is calculated, including extra income from scrap counters, ‘Ardboyz bonuses, skills, etcetera, it should be normalised by putting it through the chart on page 65 of Da Uvver Book. The total number of models includes Squiggoths, but Squig Riders/Boar Riders count as one model. Hunting and foraging in the fungus groves is not a particularly safe pursuit, particularly when the surrounding flora has a longer attention span than most of the fauna. Should three or more sixes be rolled by foraging Orks then something nasty has happened probably involving sharp teeth and quite possibly venom too. One random Fickie, eager in his stupidity, has tried to outdo the big hauls of his brethren and ventures into Ere Be No Stuff, the wilderness has him now. Remove him from your roster along with any equipment he was carrying. If no Fickies are foraging, ignore the result. There are no Doks in the mushroom groves and Feral Orks cannot be taken to Mektown. Any serious injuries sustained are permanent. Roll a D6 per scrap counter fed to the Squiggoth and consult the table. You may feed it any number of counters. Each scrap counter fed to a Squiggoth adds D3 to its value, regardless of the result rolled. Scrap counters used in this way provide no additional income for the mob. The Fickie feeding the Squiggoth clearly wasn’t careful enough, and wandered too close to its jaws! This Fickie is dead; remove him and all his equipment from the roster sheet. As squiggoth-feeding is a dangerous job, it’s usually the least experienced Fickies who are tasked with it, in order to toughen them up, although you may elect to lose a more experienced Fickie if you prefer. Roll again on this table, re-rolling further results of 1, to see what effect the scrap has on the Squiggoth. Either the scrap has gotten stuck in the Squiggoth’s throat or it just doesn’t agree with the beast! Roll on the permanent damage table for this Squiggoth, re-rolling results of Dead, Badly Mangled and Captured. The Squiggoth seems pleased with his meal, but the scrap has no noticeable effect beyond this. The Squiggoth is in a good mood after such a nice treat. All Leadership checks to control him are at +1 for the next game in which he participates. The scrap has accelerated the Squiggoth’s natural healing process. One randomly determined permanent injury is now healed. The Squiggoth has developed a second set of vocal chords, or possibly even a second head! He now rolls 2D6 instead of just D6 for Revvin’ and Shoutin’ tests. The Squiggoth’s tail mutates to grow spikes, scythes, a bony club or similar. The Snapping Jaws bonus now applies to hits on infantry models at the rear as well as the front of the Squiggoth. The Tail Weapon counts as Gubbinz, and may be damaged by enemy attacks as normal. A Squiggoth may have more than one tail weapon, but there is no additional effect beyond having a back-up Gubbinz if one is shot off. The Squiggoth’s hide hardens, and it counts as having the Armour Plates gubbin. It can gain this mutation multiple times, but as normal it cannot get an Armour Plates save better than 4+. The Squiggoth becomes heavier; maybe its bones are denser, or maybe its muscles bulge more than before. Either way, it’s better at stomping puny Trukks and the like now! The Squiggoth now participates in rams with vehicles as a normal Trak. If this result is rolled a second time, it counts as having the Reinforced Ram Gubbinz as well. If it’s rolled a third time, the Squiggoth becomes Supa Stompy and may apply its Reinforced Ram bonus to all hits inflicted in a ram, not just one. Note that none of these upgrades affect sideswipes; no matter how stompy he gets, a Squiggoth still needs to keep his balance! After eating the scrap, the Squiggoth feels like a young pup again. Its maximum thrust move is improved by 1″. The Squiggoth sprouts mean-looking spikes from its hide, and counts as having the Spiky Gubbinz. If it was already Spiky or rolls this result twice, it counts as being Extra Spiky. Note that spikes cannot improve the strength of Snapping Jaws. Part of the Squiggoth mutates and becomes more muscular. Roll a D6 to determine a hit location; the armour value of this location is increased by 1. Each location can only become Tuff once. The Squiggoth’s mouth mutates as it chews, and becomes an even deadlier weapon. Roll a D6; on a 1-3 the Squiggoth’s mouth can be used as a Big Grabba, on a 4-6 it may be used as a Wrecker Ball. 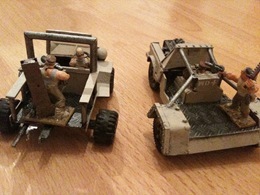 Unlike the vehicle-mounted versions of these Gubbinz, they are controlled by the Squiggoth’s driver rather than a crew member, but he cannot fire a weapon if the Big Mouf is used. Nothing has changed that’s obvious from the outside, but there are big changes on the inside! From now on, if models on the ground are within 2“ of the Squiggoth when it takes a penetrating hit to the Squishy Bitz they will take a S3 hit on a 4+ as they are burned by its blood. Obviously the Squiggoth itself is immune to this! If this result is rolled again, increase the strength of the hit by 1. Something’s brewing inside this beast! The Squiggoth may now breathe forth flames, plasma, noxious gas or some other unpleasant substance in the shooting phase. This shooting is directed by the driver, so the Squiggoth must be under his control at the time, and he may not fire any other weapons or operate a Big Mouf. Bad breff counts as Gubbinz and has the same shooting profile as a Skorcha. The Squiggoth has eaten his fill and with a contented sigh, settles down to sleep. He cannot be woken and must miss the next game. Roll again on this table (with the same number of dice), re-rolling further results of 18 or more, to determine what effects the scrap has on him while he sleeps. While lacking the finesse and adornments of a Mektown made Choppa or Club, these a big lumps of sharp metal and heavy stone that allow Fickies and Wildboyz to inflict just as much damage. See page 53 of Da Roolz for the statline. 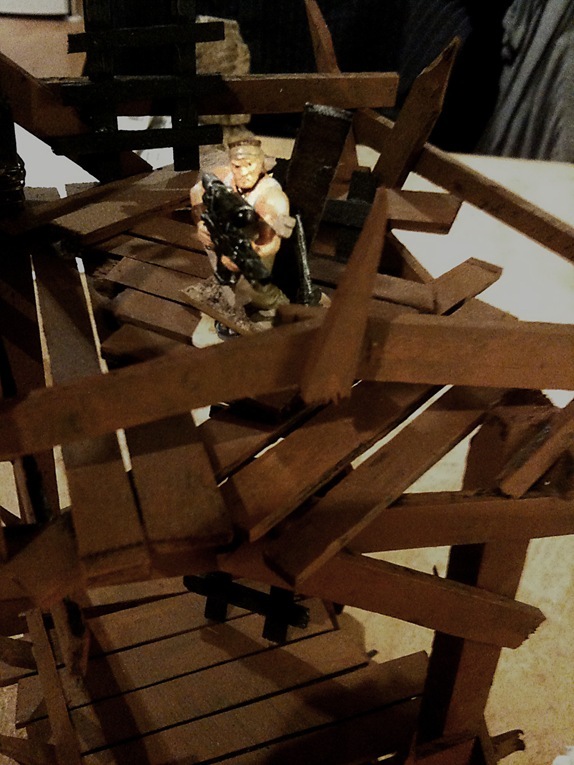 A particularly large chunk of debris, tossed into the Howling Hills, stuck on the tree-trunk like branches of the mushrooms that grow in the Howling Hills and given to the most focussed looking Wildboy is a recipe for carnage at the best of times. Ideal for hunting small squigs at range and dealing with larger ones up close, these are one of the simplest weapons ever made. Good thing too as the guys wielding them might be the stupidest creatures ever to draw breath. See page 54 of Da Roolz for the statline. When a Weirdboy joins a mob of Feral Orks, the elder Weirdboyz present him with a staff with a shiny piece of metal on top of it. This acts as a conductor for the Waaagh!!! fizzing inside his head, helping him to direct it in positive ways like making heads explode as opposed to negative ways like making his own Boyz heads blow up. See page 12 of Digganob for the statline. Further details on Weirdboy staff can be found in the Weirdboyz section. See page 55 of Da Roolz for the statline. Cunning Feral Ork engineers have devised a bow that stays pulled back even if you forget that you’re holding it, cutting finger loss in a mob by over 30%. Given the number of legs a squig can have, several bolas might be needed to bring a big one down. 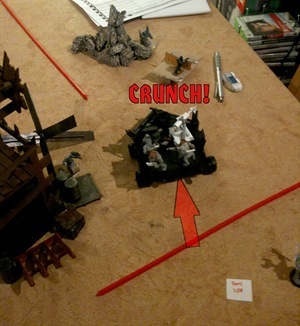 Funnily enough, it only takes one bola to bring down even a full grown Ork if its big enough and thrown hard enough. See page 59 of Da Roolz for the statline. 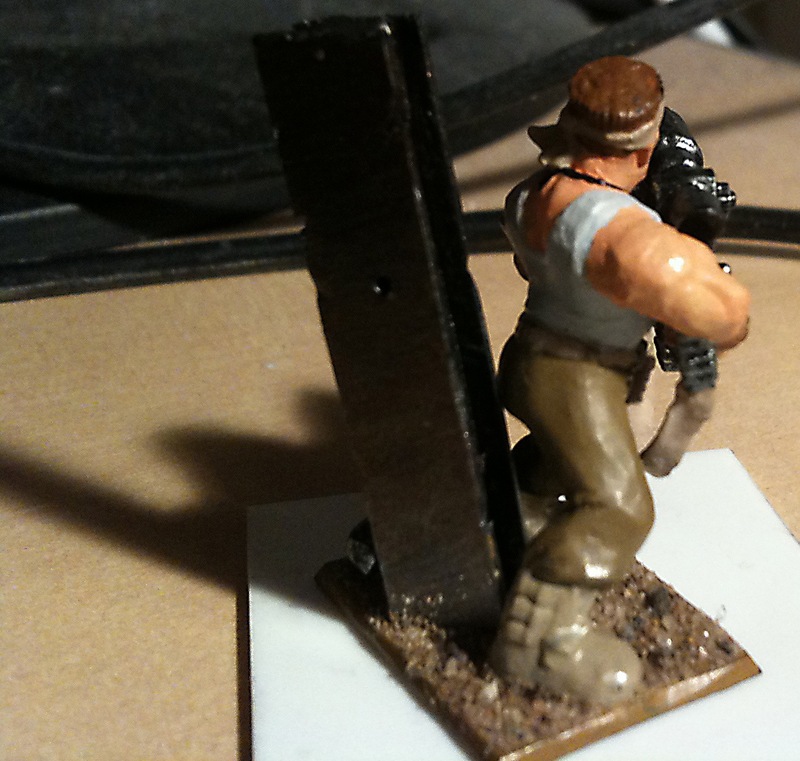 A simple thong made of leathery squig hide allows a Feral Ork to chuck rocks with greater strength and precision. Of course the squigs aren’t always happy about Orks trying to harvest their leather. Special Rules. If the warrior doesn’t move he may fire twice at short range. Discovered when an Ork threw a bent piece of metal at a squig and missed. To his immense surprise the piece of metal came back, smacking him in the head as it did so. Before long, everyone was trying it, with mixed results. Feral Ork boomerangs can’t be thrown by anyone else as its the Waaagh!! that really gives them their returning property. They don’t always come back when thrown by Feral Orks either. Usually because they’re stuck in something’s ribcage. Special Rules. May be used while running. Feral Orks don’t have anything as clever as a fabricated shield. These are usually panels or airlock doors they find strewn around the Skid. A fearsome weapon of such tremendous weight that only a Brute can carry one – when this weapon descends at speed, whatever it hits stays down. Essentially a small boulder on the end of a handle of some sort, a Big Hamma is incredibly clumsy, but terrifyingly dangerous too. Special Rules. Loses draws. Fumbles count double. Two-handed. Reduces wielder’s Movement by 1". After beating a mob, Feral Orks shred vehicles as trophies and cobble the leftovers into armour. Although it still looks like bit of trukk wrapped round an Ork it’s much tougher that the armour of even a successful Nob. Only a Brute has the strength to wear such a "garment" and still fight and even he will be slowed by it. Iron Hide confers a 4+ armour save and reduces the wearer’s Movement by 1". It also halves their Initiative, rounding up. Feral Ork are rather primitive and are gearing up for battle with much gusto. Their ideas are simple and their technology is nothing more than sticks and stones, but they still try their hand to fight the good fight. The Spike Kannon exists in many ways, shapes and forms and unsurprisingly, with varying results. Some stones will be too big to throw and it will crumple slightly, other spikes might get lodged in the splinters of a badly made blowpipe. To represent the inconsistent and unreliable design of the Spika Kannon, rolling a sustained fire dice suggests it never shoots the same way twice; sometimes hurtling two or three bitz at the enemy, sometimes only one, and sometimes things just go horribly horribly wrong. Relatively crude, the brightest of Weirdboyz have managed to cobble together something resembling the Splattapault and stuck it on the back of a mighty squiggoth. Although, it could be argued by an outside observer that the Gretchin Revolutionary Kommittee quite likes the idea of Orks that are willing to take direction from "runty Weirdboyz" and might have left a few lying around as a way of eliminating the Mektown Orks. See page 38 of Digganob for the statline. Special Rules. Cannot be fired if the Squiggoth thrusted. A delicious treat of squigmeat, Wildboyz can use these single-use items to add to their leadership score when attempting to bring their squig back from runnin’ wild. 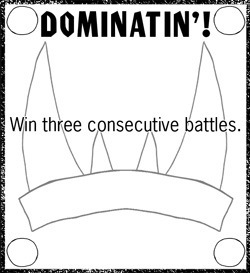 There is no limit to the number that may be used in a turn but they must be assigned to a specific Ork and cannot be transferred during a game. Feral Orks don’t have access to anything as advanced as grenades, but they do have some thrown weapons, namely rocks. More intelligent Orks favour nice shiny weapons, but Fickies are rather primal and enjoy pelting things with stones. Fickies may hurl rocks at a target instead of firing a weapon, inflicting a S2 hit. Multiple Fickies may combine forces to create a much more effective attack. Each additional Fickie adds +1 to the Strength of the attack. Nominate a large target (Vehicles, Fort Gates, etc..). Small targets cannot be targeted. Determine whether the Fickies are working together or throwing individually. Measure range from furthest away Fickie. Roll an Artillery Dice and halve the result. A Misfire result means no rocks hit their target. If the result is the same or greater than the range to the target then a successful hit is scored. Example: Five Fickies throw rocks at a fort gate. They can either inflict five S2 hits, or combine them to create a single S6 hit. The range is measured as 4" to the gate. 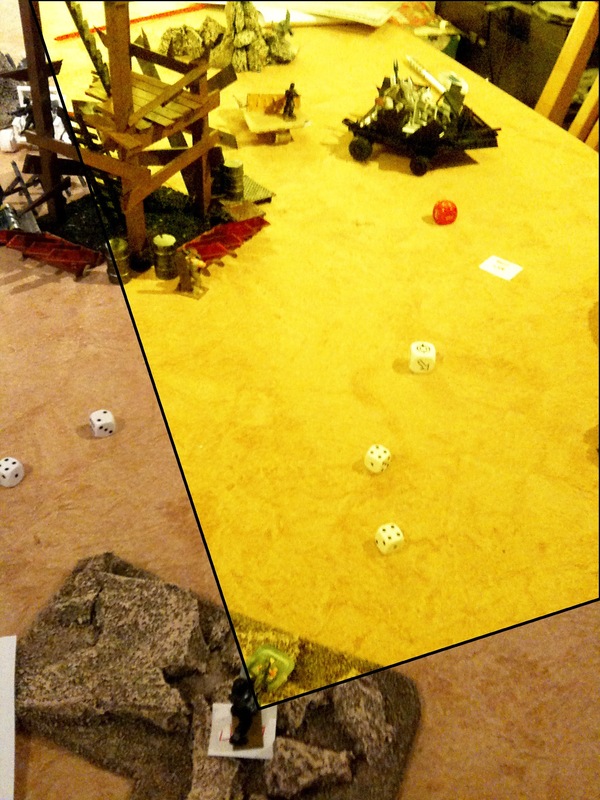 The player rolls the Artillery dice and gets a 10, giving a maximum range of 5". The gate is within range and so is hit. In campaign games where experience points are earned for penetrating armour Rock Chuckin’ does not confer +5 experience for each Fickie hurling rocks. Instead a penetrating hit will give +1 experience to each Fickie involved in the attack being resolved. 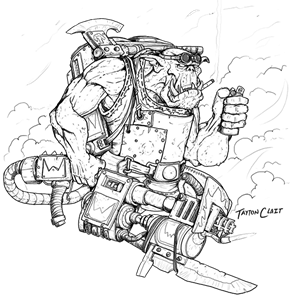 Note on Squigz and Boars – In the ‘Ere Be Stuff expansion we use the term squig to refer to the units that Feral Ork Wildboyz can ride. Since these rules are based on the rules for Boar Riderz, also known as Snortaz, the two terms are used almost entirely interchangeably in this expansion. If you want your Feral Orks to ride pigs and sit atop a massive boar as they wade into battle, that’s also awesome. While plenty of squigs of various sizes and shapes grow around Mektown, the arid conditions aren’t even close to ideal for them. Up in the Howling Hills however, the cool air, more frequent rainfall and volcanic ash provide an environment that makes all things Orky grow a bit better and bigger. Mighty mushroom stalks like redwood trees came first, providing cool shade and then the squigs began to grow. And grow. And grow! Giant squiggoths roam the mushroom groves, eating the flora and fauna without discrimination. The Weirdboyz have found they can exert some degree of control over these behemoths and at Weirdboy’s direction, have put them to work in fighting the other denizens of Angelis, serving as mighty mounts carrying the squabbling Feral Orks into battle. Squiggoths are large and lumbering but can give a fair bit of speed if whipped enough as long as the driver doesn’t get too over enthusiastic and lose control of the beastie. Squiggoths move like Ork traks, i.e. 6" gas engines, 5" thrust, however as soon as a thrust test is failed the driver has over done it and must roll on the Rampaging Squiggly Beast table. The beast counts as having no driver for this turn (see pg. 34 of Da Roolz). Next turn the driver must pass a leadership test in order to regain control or the beast continues rampaging. 3 – The beast bucks wildly, throwing any crew off (does not include the driver, who has reins to hold onto). Each crew member may attempt to stay aboard by rolling equal or under their Strength, if they succeed they are unaffected but can do nothing else this turn. Squiggoths may perform slow speed manoeuvres as detailed on page 32 of Da Roolz. Squiggoths are snarling behemoths and their simple brute and ferocious nature is testament to that. They eat anything they can chew and headbutt everything else. This is represented in game terms in that it can ram like any other vehicle with one exception, in head-on collisions with other vehicle they simply are not as tough. In the case of a head-on ram with another vehicle (this does not apply to other Squiggoths…they’re quite soft-headed) it will only inflict D3 damage on its opponent, instead of the usual D6 damage. 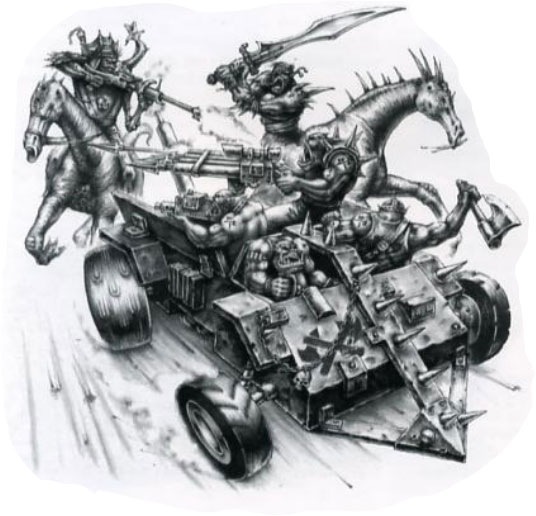 While trukks, traks and buggies rely on their crew to inflict most of the damage, Feral Orks struggle to keep the Squiggoths from causing too much. Their snarling snapping maws often maul anyone foolish enough to stand too close. Models on foot that are run down, raked, or sideswiped by a Squiggoth will take a S5 hit, rather than the S3 hits as detailed on page 39 of Da Roolz. One of the ‘invaluable’ members of the crew has been hit. 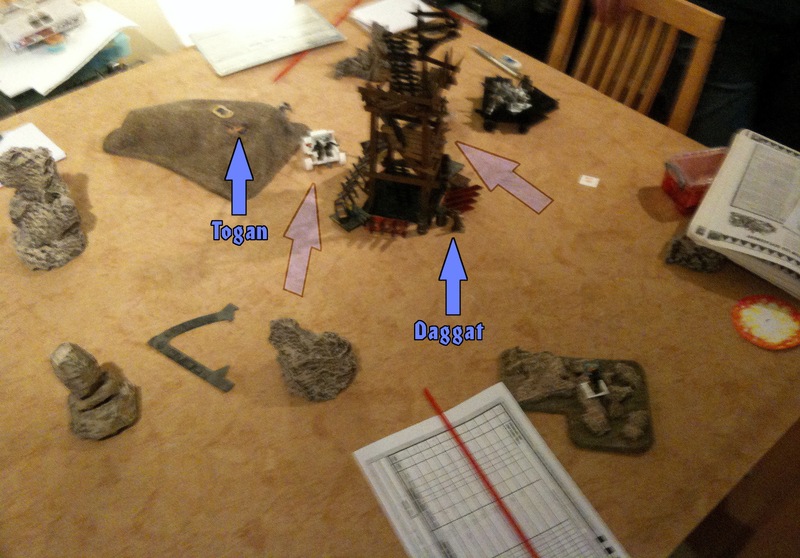 If there is more than one crew member, randomly determine which one it is before rolling on the table below for damage. Any warrior that goes down while on the vehicle, topples over the edge landing D3" away from it in a randomly determined direction, suffering a further S3 hit on the roll of 4+. If there is no crew on the Squiggoth then the driver is hit instead. 1-3 Stray Shot! The crew member is lucky enough to dodge out the way. Unfortunately, none of his other mobsters are as aware of their surroundings. Randomly determine any model on the Squiggoth (except the driver). He takes a S3 hit. 4 Impaled! The crew member is jostled by the hit, falling back into some pointy shrapnel. He takes a single S4 hit. 5 Lost footing! 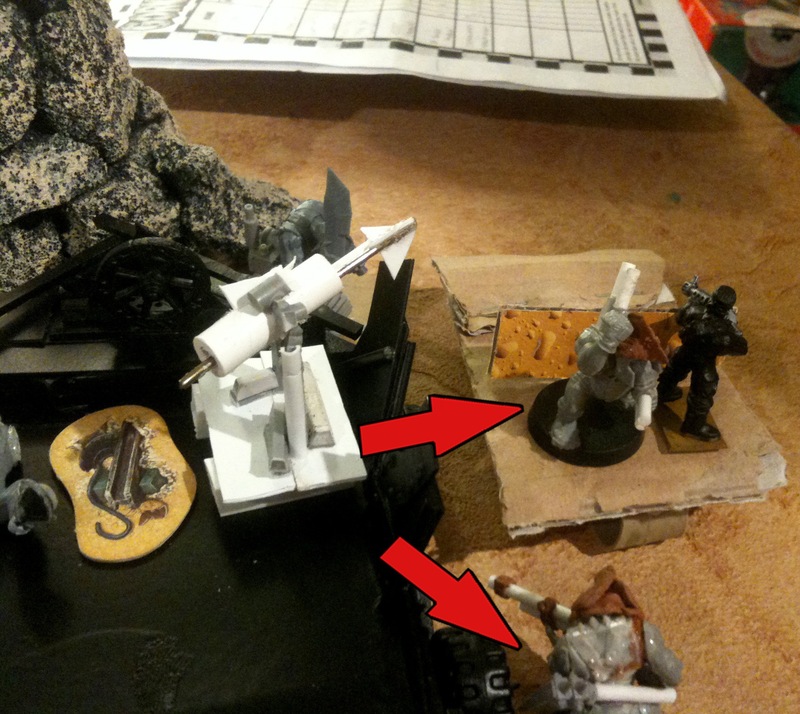 The crew member struggles to remain standing and must roll under his strength on a D6 to remain on the Squiggoth. 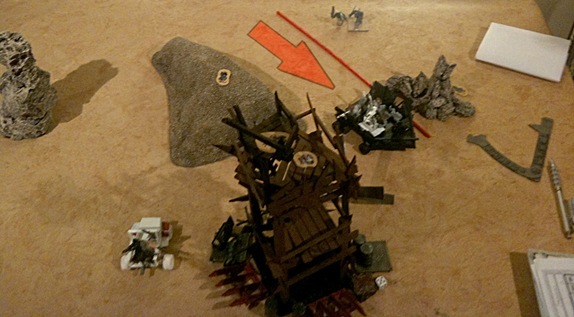 If failed, he falls, landing D3" away from the Squiggoth in a randomly determined location, taking a S4 hit. 6 Hit! The crew member takes the hit from the weapon as normal. In the event of a ram, swipe, rake, crash or collision, he takes a S3 hit. The fixed weapon is hit! Roll a D6 to determine the results. In the event the Squiggoth has no fixed weapon, then the crew is hit instead. If the Squiggoth has no fixed weapons then the crew is hit instead. 1 Me ‘and! 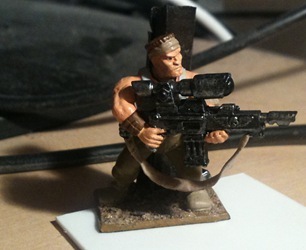 The gunner (for Orky reasons) got his hand stuck in the dakka end. Getting it out was quick and painless for him, but the weapon needs a quick fix. The weapon cannot fire in the mob’s next shooting phase. 2 Bent! It is frustrating enough to aim one way and it to fire the other, but now the thing is bent, firing off to one side. The gunner may continue to use the weapon but does so at -1 BS for the remainder of the game (this penalty does not apply to firing any other weapons). 4-5 Broken Trigger! The weapon is relatively undamaged, except that the trigger has broken off and nobody has realised…or even noticed. The weapon cannot be used for the rest of the battle. 6 TWANG! 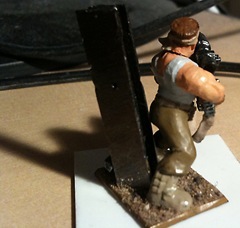 The tiny thread of rope binding the weapon together has snapped, flinging wood, squig bitz and bow strings everywhere! The weapon cannot be used for the rest of the battle and the Gunner receives a S2 hit. If the Squiggoth has any Gubbins then randomise which is hit. On a 4+ it is damaged and can’t be used for the rest of the battle. It will be automatically repaired before the next game. If there are no Gubbins then the Squishy Bitz are hit. 1-3 Hamstrings are Gammy things! Its hard to run with bullets and shrapnel in your legs, so its no surprise that the Squiggoth slows down. It is at -1 Movement for both regular and thrusting movements. This is cumulative and if it reaches 0, it is immobilised and crippled. 4 Taken aback! The blow to the legs has sent the Squiggoth off balance. It swerves before rolling on the Rampage table. 5 ‘Urty Bitz! The hit gets the Squiggoth in a sensitive area that is agonizing. Roll on the Rampage table to see the results. On the result of 4+, instead of lumbering forward 5", it is immobilised and crippled, representing just how much damage was done on the inside. 6 Swept off ya feet! The Squiggoth’s feet are almost literally kicked out from under it and it falls flat on its face. It is immobilised (but not crippled). If there is no driver then the Squishy Bitz are hit instead. 1 Close Call! The shot buries itself in the driving seat without even touching the driver. It as no effect. 2 Whoops! It was such a close call that the driver wasn’t paying attention and must take a leadership to regain control. If failed, roll on the Rampage table. 3 Impaled! 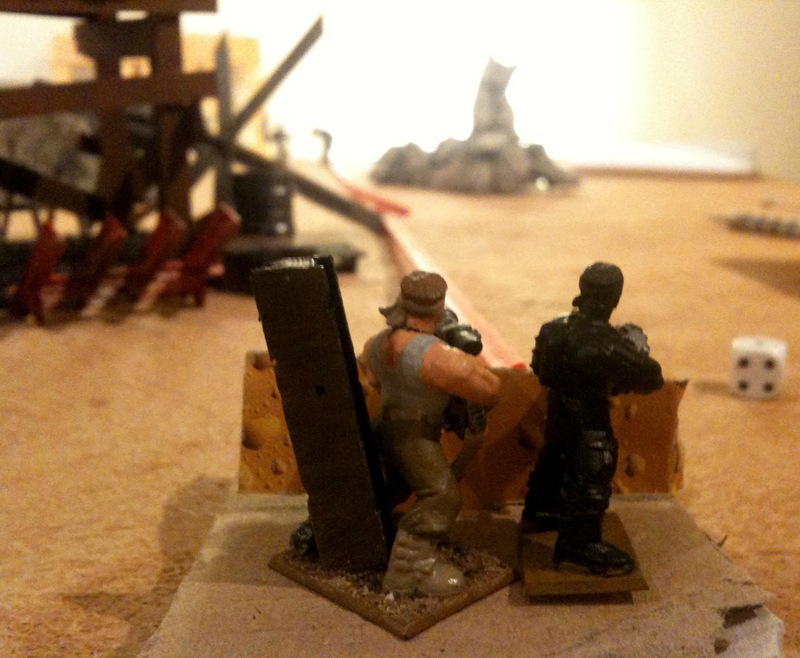 The crew member is jostled by the hit, falling back into some pointy shrapnel. He takes a single S4 hit. 4-6 Hit! The driver is hit by the weapon as normal. In the event that it was a collision, ram, rake, swipe or crash. He receives a S4 hit. 1 Buck! The Squiggoth rears up in pain. Roll on the Rampage table to see the effects. 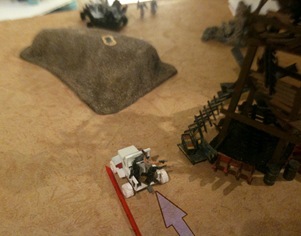 After the results, the Squiggoth is deemed crippled and immobilise. 2 Stagger! The Squiggoth goes into some sort of daze from the force of the blow. It staggers D6" in randomly determined direction before just lying down. It is the driver’s fun job of waking it up. Roll a D6 each time you are trying to get it to move. 3 Don’t Panic! The events of the battle are making the Squiggoth as stubborn as it is bad tempered. The driver has to whip it to get it to go anywhere. The Squiggoth can only move as if it is thrusting for the remainder of the game. 4 Hang on! 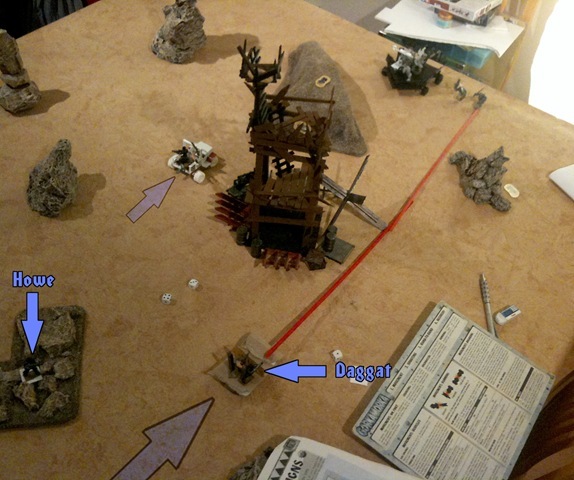 The Squiggoth bolts forward as if its being whipped. It must thrust forward until the player fails a thrust test or it hits something. 5 ‘Ope dat wazn’t important… Something blue and wibbly is hanging out of the Squiggoth and oozing. Seeing as Red ‘Unz go fasta, it becomes clear that blu’ ‘unz slow you down. The Squiggoth slowly lumbers around before tiring, collapsing in a messy heap. It is immobilised and crippled. 6 Troublesome beast! The Squiggoth has been put off by all the action. The driver must pass a leadership test each time in order to control it. If passed, it acts as normal. If failed, it swerves and moves D6" forward. A combination of blood loss, organ damage and general mistreatment have caused the Squiggoth to die. If one mob bottled out, the other gains an extra 2D6 teef stripping the carcass for tasty meat if they leave a Boy (or equivalent unit) to strip it. The model left to strip the carcass doesn’t contribute anything else to the mob’s income this game. The Squiggoth has taken severe damage and is barely alive. Roll a further D6 times on the permanent damage table, ignoring Dead, Captured, Furious Regeneration or Minor Injuries. The damage has made the Squiggoth more vulnerable to attacks. Reduce it’s armour over all areas by 1. The Squiggoth has numbed areas around where its reins are attached, making it harder for it to interpret steering commands. When making a leadership check to turn or swerve, its taken at a -1 penalty. The Squiggoth legs don’t quite move in sync any more, violently rocking all aboard. All ranged attacks made from the squiggoth are taken at a -1 penalty. The Squiggoth has a hobbling limp and its movement is reduced by D3". Roll now to find out how much to subtract from its movement score. The Squiggoth has a bad attitude as a result of being shot, rammed, burned and poked all the time. Before a battle, roll a D6. On a one, the squiggoth cannot be persuaded to behave and is not available for the battle. The damage isn’t as bad as it could have been. A few delicious squigs and a tickle in just the right spot will make sure the beast is ready for the next battle. The enemy mob has captured the squiggoth and is going to cut it up for food to eat and sell for which they will gain 2D6 Teef. The Feral Orks have one chance to recapture their squiggly beast before it ends up between two slices of fungus bread, using the normal vehicle recovery scenario. The beast has many mighty slashes and scars all over it making it look tougher and scarier. All warriors on board the vehicle have +1 to Leadership, riding atop the seemingly invincible behemoth. The battle has triggered a flood of signal compounds which have activated a flurry of mitosis and cellular regeneration. The Squiggoth is healed of all permanent damage by the process and has no further effects. Squigz are wild, dangerous and at the best of times, utterly unmanageable. Still, occassionally mad Wildboyz will attempt to ride on the bigger squigz and with a little patience and lots of delicious yummies as incentive, the squigz can be persuaded to at least bite enemies before allies. When a Wildboy wants to become a Squig Rider he must go off into the Howling Hills to find a Squig to call his own. When you purchase a Squig for him to ride, the Wildboy misses his next battle while he trains the squig not to kill him and to tolerate him riding it into battle. After one battle has elapsed, the Wildboy returns to your mob, dead chuffed as his new pet runs roughshod over his enemies. Squigz purchased at mob creation are available immediately without the one battle waiting period but any purchased subsequently must undergo the training period. An Ork riding a Squig moves at 7". Squigz can charge and gallop in exactly the same way as muties, but since squigz are considerably less co-operative than Mutie Beasts, Wildboyz cannot fire on the gallop, or set Overwatch. Due to the roaring and slavering, Squig Riderz cannot hide. Squig Riderz have a 90 degree fire arc to the front just like a footer. Feral Orks can use the following Ranged Weapons when mounted on a Squig: Boomerang, Spear, Sling, Bolas. 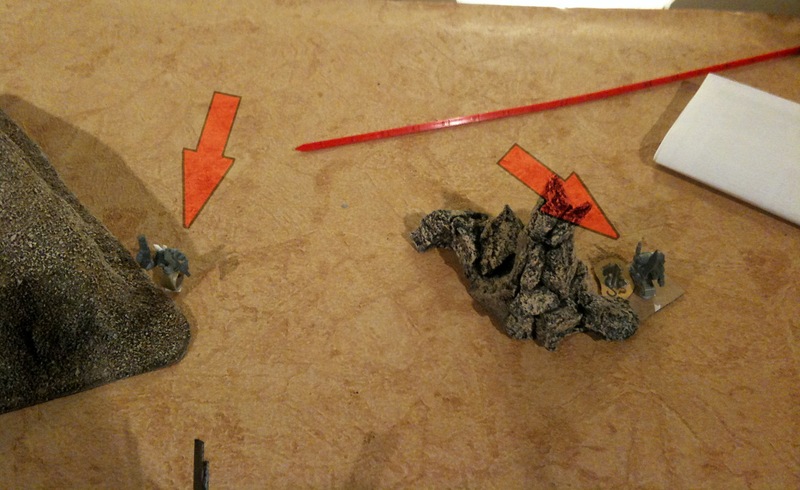 Regular Bows and Crossbows can be used if the Ork passes a successful initiative check but if he fails, the Squig goes wild. See Squigz Wild!! for a description of how this functions. Shooting at Squig Riderz: Shooting at a Squig Rider follows the same procedure as normal. If the Squig moves at over 10", there is an additional -1 to hit modifier due to the speed (and dustcloud!) Squig Riderz are not driven off by enemy fire like Muties are. In fact they’re more likely to charge the enemy! Squig are brutal in close combat and give the Rider an additional attack in melee combat. When mounting a Wildboy on a Squig, be sure to add +1 to his attack statistic! Saving Throws: Due to the shifting, rampaging nature of the Squig, Squig Riderz have a natural 6+ armour save, just like Muties. Riderz must stop for a turn to pick up Scrap just like Muties, they suffer no movement penalty for carrying it and may only carry one counter. Attacking Vehicles: Riderz do not dismount in battle. When they attack a vehicle they test initiative as normal, but do not board the vehicle. A Rider who successfully attacks a vehicle fights a crew member as normal, but the crewman will only fall off his vehicle if he goes down, and the Rider is simply moved out of contact with the vehicle if he loses, in addition to any wounds he may take. The vehicle may move away from the Rider in its next movement phase as normal, but may not sideswipe the Squig Rider. Squigz cannot climb fort walls, and therefore will need to destroy the gate of the fort to get in. Squigz count as footers when trying to get through holes in the gate. While Wildboyz may claim to have "tamed" their squig, it couldn’t be further from the truth. The only thing keeping the Squig in any semblance of line is the reigns the Orks have crudely lashed to them. Dropping these for even a moment will be taken as an act of weakness (or deliciousness) and the squig will attempt to escape. The details of when this can happen are listed below. A Squig automatically Goes Wild if its rider goes Down. If the rider goes Out of Action, the squig runs away- remove the model as usual. Wild Squigz bite everything in sight, including other Squigz!. If a Wild Squig moves within 1" of another Squig, then the rider must pass a Leadership test or his squig goes wild as well! Any attempt to Sideswipe or Run Over a Squig Rider will not be taken well. Once the attack has been resolved, the rider must pass a Leadership test to control his Squig, even if the attack missed or did no damage. Grabbing a Scrap counter means letting go of the reigns. Oops. The rider must test his Leadership after digging up some scrap. 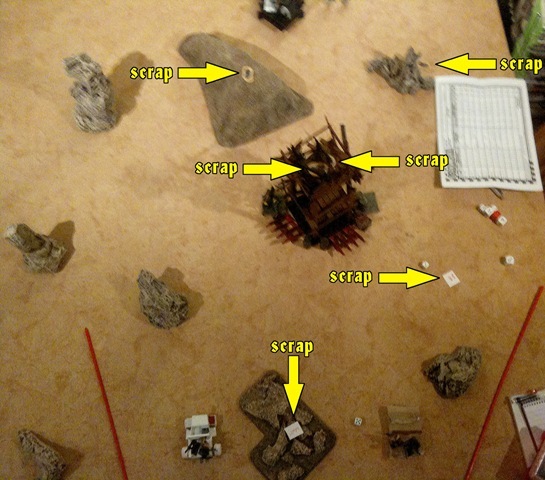 If he fails, the squig goes wild, but the Scrap is still collected. A Wild Squig moves D6" in a random direction determined by scatter dice at the start of the movement phase, Due to the delicate means needed to regain control through beating, yelling and biting, the Ork is too busy to engage in ranged combat until he regains control of his squig. During the Recovery Phase, the Wildboy can attempt to regain control of his squig by making a Leadership roll. If he passes, the squig will calm down a little and can be directed as normal again. If a Wild Squig moves into contact with an enemy model it immediately begins the happy task of chewing on the enemy and combat will proceed as normal with the Squig Rider counting as having charged the enemy.The squig will be under the riderz control again after the combat resolves. If the rider is down when this happens however, he is put Out of Action and the model is removed from play. Wild Squigz never willingly attack vehicles and stop 1" short of a vehicle if wild movement would bring them into contact with it. Occasionally an Ork will no longer be suitable for riding a squig and the reins must be passed to another. To transfer ownership of squig to another wildboy, both the current and future rider must miss a battle while the current rider shares his secrets of how he got the squig to not kill him. If a squig rider dies as a result of battle, there’s no time to pass on the secrets of what persuaded this particular squig to tolerate him and it runs off into the wilderness in the wake of its riders death. Feral Orks mobs aren’t cohesive units, in fact they’re a terribly organised rabble that sometimes realises there’s an enemy to fight! At any given moment in time there’s a squabble going on about whose shiny thing that is, or where the yummiez went, or how far away that rock is. Normally the biggest boy in the group will spend as much time yelling and cursing at them to try to keep them focussed as he does actual fighting, although this only works some of the time. The fighting always starts amongst Fickies but if all of them are already bickering then the Wildboyz tend to wade in to sort things out, usually dragging the Weirdboy with them. To represent this at the start of every turn the mob’s Brute must take a leadership test. If he fails, count the difference between his score and his Leadership characteristic and roll a corresponding number of D3s. That total is how many Feral Orks are affected by Animosity. When determining which models are affected by a failed Animosity check start with the Fickies. If there are no unaffected Fickies left then assign the remainder to the Wildboyz and lastly the Weirdboy. Brutes are never affected by failed Animosity checks. For example a Brute with a Leadership of 6 takes an Animosity check and rolls 9. The difference between his score and his Leadership characteristic is 3, so 3D3 models are affected. The result is 9 but there are only 7 Fickies on the board thus his two Wildboyz are also affected. If the Brute is Down or Out of Action then a Wildboy can take the test, and lastly a Weirdboy if there is no one else (Fickies can never test). Should no one be available to maintain order then take the test anyway, but without a leadership characteristic. Example: with no one able to take the check the player takes the test, rolling a 7. As a result 7D3 models are affected by Animosity this turn! Orks are an intrinsically psychic race and this manifests itself in arguments too (this is quite possibly why bar brawls are such a popular pastime in Mektown). All the models affected by Animosity will react in the same way. Roll on the Animosity Table (D6) to find out what they’re up to for the duration of the turn. The warrior doesn’t feel like fighting and just sits down. He counts as pinned for the rest of the turn (he will have recovered by the start of the next turn, unless another Animosity check is failed). The warrior charges the nearest target, be it friend or foe. The warrior charges towards the nearest enemy target, even if he can’t reach it. The warrior is overcome by Frenzy and charges the nearest enemy target, even if he can’t reach it. In terms of which models are affected it will always be those furthest from the model taking the Animosity check. A model affected by animosity holding a scrap counter will not move, instead they hold onto the shiny bits tightly. Any models within 6" of such a warrior that are affected by animosity are overcome with jealousy and will charge over to them, spending the rest of the turn squabbling. Animosity affects models onboard a vehicle differently. Warriors onboard spend the rest of the turn brawling with each other or hurling insults. Sometimes both at the same time. The vehicle may still move as normal and Big Gunz may still fire, but the crew may not disembark or shoot. If boarded they will still fight as normal. Fickies are a slow bunch at the best of times, but when there’s a fight to be had you’d think they’d be able to hold it together for a few minutes – not a hope. Fickies on their own suffer from Stupidity at all times (as detailed on page 49 of Da Roolz), however to prevent this, they can stick together in a group where the build-up of Waaagh!! energy is enough to keep them on track for a while. If before they move, Fickies are within 2" of 2 or more friendly models, they do not suffer from stupidity that turn. Fickies in such a group cannot Hide or go on Overwatch as the others will give them away, distract them, or just generally make a nuisance of themselves. For the purposes of Bottlin’ Out tests Fickies only count as half a model. Weirdboyz are relatively uncommon in normal Ork society as they suffer ill-effects as a result of being immersed in the psychic field that all Orks generate and the few that do survive are generally put to work as walking weapons to use against the Orks enemies. Through the mutations and DNA damage done to the Feral Orks, the Brutes, Wildboyz and Fickies radiate their psychic energy differently, essentially on a different frequency to the Weirdboyz, allowing them to flourish. The genetic damage done also seems to have made Weirdboyz more common in Feral Ork society as well. Weirdboyz have several special abilities that no other Ork has access to which are detailed below. Weirdboyz begin their time in a Mob with the following powers and can gain more when they gain experience. See the Skill Table – Da Waaagh!!! for further powers that can be acquired. The Weirdboy can only use one power per turn and it consumes his entire shooting phase. Certain powers are cast outside the shooting phase but the model still cannot shoot if he uses one of these. Additionally, a Weirdboy cannot run and use one of his powers in the same turn in a manner similar to shooting. The Weirdboy focuses all of the Waaagh in his head on a single Wildboy or Brute, making them stronger and orkier than before. This manifests itself as a +1 to either WS and BS or as +1 to Initiative until the end of the turn. This power has a maximum range of 10". The Weirdboy can channel the Waaagh!! to boost Fickies mental abilities so that they can return to a functioning group. Up to 3 Fickies can be made to move closer to one another by 4". If this places them within the radius for Fickies Psychology to take effect then they do not suffer from Stupidity this turn. This power can only be used at the start of a turn before any movement takes place but still consumes the shooting phase of the casting Weirdboy. This power has a maximum range of 24". E.g. Three Fickies are 4" away from one another at the start of your turn. The Weirdboy can spend his shooting phase at the start of the turn before movement and move them up to 4" towards each other until they are within 2" of one another using Cunnin’ of Mork!. The Weirdboyz have greater access to the might of Gork and Mork as they grow in power and experience. It allows them to draw upon the nigh infinite power of da Waaagh!! to produce powerful, awe-inspiring and sometimes downright silly effects. Weirdboyz can roll on the Waaagh!! powers table instead of a normal skill table should they wish to. Roll a D6 to determine which power the Weirdboy adds to his repertoire. If you roll on the table and get a result for a power that you already have, you may either reduce the difficulty of the power in question by 1 or roll again on the table until you get a result you do not already possess. You do not get to choose which ability you get like other skills on a duplicate result, the Waaagh! is simply too chaotic and Orky for any kind of structured learning to occur. This affects all models within 2D6" of the Weirdboy, sapping at the mental energies of those nearby. All models are automatically Pinned, including your own warriors. Pinning is resolved in the usual manner. This affects models that are usually invulnerable to pinning as well. This particular channeling fires small stinging lightning in an 4" template (a standard Gorkamorka blast marker) around the Weirdboy. All models caught in the template are driven away from the Weirdboy D6". Unlike other powers a Weirdboy may use this ability while in Hand to Hand combat thereby disengaging. Tiny slippery mushroom like tendrils sprout around the Weirdboy within an D3+3" template centred on the Weirdboy. All terrain within this template is considered difficult terrain and already difficult terrain becomes Very Difficult terrain and remains until the start of the Weirdboyz next turn. If this spell is cast from a vehicle the template moves with the squiggoth and is measured from the centre of the beast. The difficulty is increased by 2 making it a Difficulty 8 power, when cast from squig-back. D6 friendly models double their Movement until the end of their turn. If an affected model does not move at least 10" while under this effect, roll a scatter dice and have him move 8" in the direction the dice indicates to burn off the excess Waaagh!!! Do this for each Ork that does not exceed 10" of movement.This power can only be used at the start of a turn before any movement takes place but still consumes the shooting phase of the Weirdboy in question. If this movement brings him into base to base contact with a foot model or a vehicle, stop the movement and resolve as normal. For the purposes of hand to hand, the Feral Ork counts as having charged. Two mighty fists of Gork appear and each attack the nearest enemy at WS 4 and S4 with a -1 Save Modifier. If the enemy falls after the first hit, the second fist finds someone else to pound on, attacking the next nearest enemy model. Enemies put down by the Fists of Gork do not automatically go out of action as models in Hand to Hand would, unless they are in base to base contact with another foot model who kindly crushes their skull. If the Weirdboy fails his roll by 5 or more, the Fists attack the nearest friendly models in order of proximity to the Weirdboy. If the enemy wins combat against a fist, it simply dissipates back into the Waaagh!!! Enemy models who best a Fist do not gain any experience for doing so. A mighty green lightning bolt strikes a chosen enemy within 12" of the Weirdboy and immediately forces 2 rolls on the Injury Table. If the Weirdboy fails his Difficulty roll by 5 or more when using this power, he is struck by the bolt himself and takes the appropriate wounds.This cannot be used on a model already in hand to hand combat. Weirdboyz can go to the elder Weirdboyz in the tribe and have them imbue their staff with additional properties in the same manner as a Kustom Job. The available Kustom Jobs are shown below. Idol of Gork – The designated model gains an additional +1 to WS or BS until the end of his turn on top of the usual +1 when the Weirdboy uses Strength of Gork! for each idol added to his staff. These can allow temporary WS or BS above the stated maximums for Feral Orks. Idol of Mork – The Fickies can each move an additional 1" when under the effects of Cunnin’ of Mork for each idol added to the staff. Symbol of da WAAAGH!! – The Weirdboy gains +1 to his roll to see if he has beaten the Difficulty Check for a Waaagh!! power for each Symbol he adds to his staff. Fickies’ Toof – When animosity takes effect, each Fickies Toof reduces the number of D3s rolled to determine the number of Orks affected by animosity by 1. A Weirdboy of 41 or above experience may have one kustom job on his staff. A Weirdboy of 101 experience can add an additional custom job. A true Warphead, 201+ XP, can have one further Kustom Job added. Each Kustom Job costs D6 teef and the Weirdboy must skip the next battle while he participates in the lengthy ceremony the elders demand. A Weirdboy can only own one staff. Weirdboy’s staffs are not lost as a result of capture as trying to move the staff away from the Weirdboy, even when unconscious the staff becomes inexplicably heavy and causes splitting migraines in all nearby. The staff is usually stuck into the sand out of his reach instead and is reclaimed if he is freed. If the Weirdboy has any Shiny Bitz on his staff, roll a D6 when he is freed. If the result is a 1 or a 2, one of the Shiny Bitz has been nicked as a trophy. The staff regains one of its former slots but all normal procedures must be followed if you wish to add another shiny bit to the staff. Remember to subtract the cost of the Shiny Bit from the Weirdboy’s cost. 1x Idol of Gork, 1x Idol of Mork, 1x Fickies Toof – The Weirdboy excels in his buffing and anger management abilities, helping to stop the mob falling apart. 3x Symbol of da Waaagh! – Focussing on power, this gives the maximum chance of success when trying to use the more difficult abilities. 3x Fickies Toof – Preventing animosity from becoming an issue in your mob keeps you mobile and fighting more than the average Feral Ork mob. 3x Idol of Gork – Improving the pairing of the Brute and Weirdboy, turning them into a brutal melee combo. Here we go, Feral Orks! There’s no photos at the moment as Midnight hasn’t quite finished them all yet. More to come. Huge thanks go out to Skippy, Mattzm, Depiff, and Flamekebab for making these rules possible. Your mob must include one Brute. Your mob must include one Weirdboy. You may include as many Wildboyz as you can afford. At least half of your warriors (50%) must be Fickies. You may take more than this if you wish, but should your mob fall below the threshold you must hire more Fickies at the earliest opportunity. Your mob needs sufficient transport for all of them. When buying squiggoths you must allocate them a Wildboy, Brute, or Weirdboy to act as the creature’s driver. If there is a fixed weapon then a gunner must also be chosen. Neither of these two positions can be held by a Fickie. Ridin’ Squigs are purchased separately from the Wildboy that rides them and the Wildboy must skip one battle training and working with the squig so that it doesn’t immediately try to kill him. Fickies cannot ride squigs as they are too dumb to remember to fight and hold on at the same time. A Wildboy mounted on a squig adopts a new statline that combines both his and the squigs stats in a manner similar to a Mutie Raider. Further details can be found in the Ridin’ Squigz section of the rules. Feral Orks use their own weapons list, found in the Armoury section. A tower of terrifying muscles, teeth and rage, these brutes lead a Feral Ork mob into battle, often with their Big Hammas leading the charge! Weapons: Brutes may be equipped with anything from the Fighty Bitz, Huntin’ Stuffz, Armour, and Boss Gear lists. Unlike other mob leaders, Brutes do not gain a bonus to their Leadership after winning their first game, however for the purposes of Fear their leadership is at +1 – they’re a bit too dim to be properly frightened of most things! A Feral Ork mob must have 1 Weirdboy, no more, no less. If your Weirdboy is killed you must replace him at the earliest opportunity. Fizzing with the power of da Waaagh! !, these little fellas pour the raw essence of Gork and Mork through their comrades and channel it through their staffs to make lightning, fire and other bizarre effects! Weapons: All Weirdboyz carry a Weirdboy Staff which they can use in combat and is factored into their cost. Additionally Weirdboyz may be equipped with anything from the Fighty Bitz, Huntin’ Stuffz, and Armour lists. Pinning: Feral Ork Weirdboyz are subject to pinning. Weirdboy Powers: Weirdboyz have a special set of skills or "powers" which only they can acquire. See the section on Weirdboyz later on for a detailed description. In Mektown, these Orks would be close to being Nobs. If only they could spell it. However, what they lack in cunnin’, they make up for in sheer Orkyness! Each Brute has a few of these around to help keep the Fickies in line and for certain special skills like squig riding. Or walking and talking at the same time. Weapons: Wildboyz may be equipped with anything from the Fighty Bitz, Huntin’ Stuffz, and Armour lists. Thicker than minced squig, in a real Ork army these guys would be nothing but cannon fodder. However, between the Brutes roaring and the Weirdboyz throbbing head veins, these slabs of muscle can be put to devastating use. As long as they don’t knock too many lumps out of each other first. Weapons: Fickies may be equipped with anything from the Fighty Bitz, and Huntin’ Stuffz lists. Fickies Psychology: Fickies are under the Fickies psychology rules at all times. Drivers and Gunners: Fickies can never act as drivers or gunners. Tuffin’ it out: When Fickies reach the starting experience threshold for Wildboyz they automatically gain +1 T in addition to any other stat increases they may have accrued. This does not allow them to exceed the maximum statline however. The Feral Orks have almost none of the genetic mechanical knowledge that Mektown Orks have and as far as can be told, no Mekboyz have ever appeared in their society, seemingly replaced by an overabundance of Weirdboyz. As a result, the Feral Orks turned to the squiggly beasts as a source of transport in order to haul vast loads and compete with the vehicles of the Mektown Orks. There are two types of squiggly beast available for purchase in a Feral Ork mob, the squiggoth and the riding squig. The squiggoth is an exceptionally large squig though not perhaps as large as those fielded by a true Ork Waaagh!!! The beast lumbers along, directed by reigns and having large platforms attached to it by whatever means necessary, even by forcing the pieces through the skin until they stay put. The lads all pile on and ride these somewhat unsteady ships of the desert into battle. The riding squig is equivalent to an Ork as a horse would be to a human except that it has a temperament more akin to an angry bull and teeth like an entire armoury of chainswords. Some Wildboyz go out into the Fungus Groves and attempt to tame these beasts to use as mounts. While the end result is far from what any animal trainer would call tame, the beast will at least tolerate being ridden long enough to occasionally be an asset in combat. When purchasing a Squiggoth a driver must be assigned, just like any other vehicle. If a fixed weapon is mounted then a gunner must also be chosen. Development on the Feral Orks is going well and playtesting is back on track. We’re nearly ready to go open beta with these guys but there’s a few things that need to be tidied up first. Today you can take a look over the mob structure they use. These monsters are pretty much the peak of Ork physiology. Standing head and shoulders above the average Nob, they’re several dozen kilos of more of muscle and sinew but that is not without its drawbacks. These Orks are by Feral Ork standards quite intelligent, which translates in reality to being dumb as three short planks. They tend to be more assured than the average Nob as no other mob members would question his dominance as long as he’s still bigger than them. While respect isn’t quite the word for what they feel towards the Weirdboyz, they understand that with a Weirdboy in tow they win more battles and they understand that if they club the little runt over the head, horrible green lightning bolts might part their head from their shoulders..
Technically the brains behind Feral Ork society, these runty little things possess a deep connection into the Waaagh!! which gives them special abilities over Squigs, the Orky mind and occasionally the power to manifest strange and deadly effects. 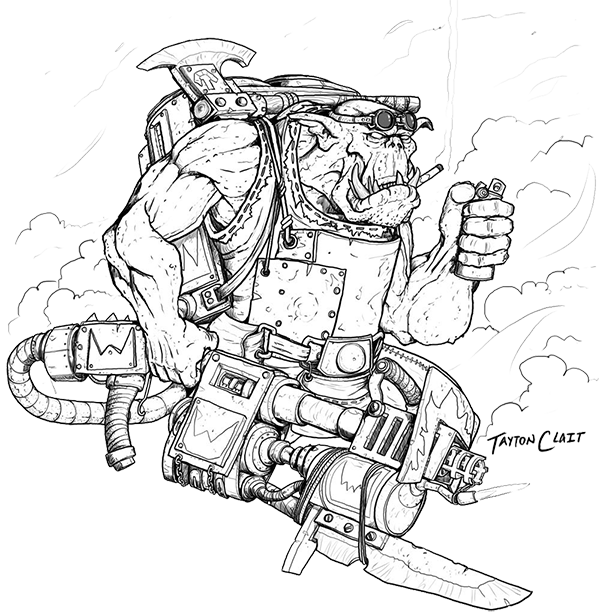 The bigger Feral Orks respect them for the abilities to aid in the capture of dangerous squigs and more recently, their ability to make their enemies stand still and gawp while a choppa comes for their head. These boyz are generally bigger than the average Ork Boy and are often around the size of a new Nob. It seems that generally over time they do become a little brighter than the Fickies that they start out as. They learn from experience, albeit slowly and are generally in charge of keeping a small group of the Fickies focussed on the current beating at hand, lest they begin knocking lumps out of each other. If there was a queue to get their supply of Cunnin’ from Gork (or Mork) in the past, these guys weren’t even near the back of the line. They were still in bed or being fascinated by a shiny piece of metal. Thicker than a space hulk hull and about as quick as frozen molasses, these guys make up the bulk of any Feral Ork mob. They understand a few concepts such as "Hit that" and yummies and a few of the brighter ones even dream of there being more yummies to come and bigger things to hit. These rare souls would be on the fast track to promotion. Except that they often get hit over the head and their yummies taken while they sit contemplating these deep philosophical issues. Grown in the higher mountains of Angelis, these massive squigs have been domesticated by some of the more ambitious Feral Orks to help deal with the concept of how to carry as much yummies as possible back to the camp. The reasoning behind this was that if something as big as da Boss can carry this much, then something this big can carry this much back to the camp. Recently, some of them have been fitted with ballistae and other weapons to be carried into battle to help even the odds against the much shootier but runtier Orks of Mektown (Or Da Shiny Camp as the Feral Orks think of it). A few Boyz manage to develop a special relationship with some Squigs they meet out in the wilds, in that they manage to get the squig not to eat them on sight. With practice, dedication and the sacrifice of a lot of smaller squigs, these ridin’ squigs have been trained to carry a Wild Boy into battle. With a terrifying roar, a massive mouth full of teeth and the endearing habit of chewing on just about anything put in front of it, these creatures add extra mobility and punch to any mob. Rabtar has been in touch on the Waaagh and requested a complete PDF of the current iteration of the rules for the Dust Rats. This seemed pretty reasonable to us, so Flamekebab was shackled to a copy of MS Word 2007 (too many tables to do it in Scribus right now, don’t ask). Several hours later and a louder tirade of obscenities than usual, the following PDF emerged. As before, feedback on the rules can go in the comments, or over on the relevant topic on The Waaagh. If you’d like to different components and Tagz, there’s links to them all here. This document was written by Benjamin Fox, Ross Graham, and Matt McPherson . It’s licensed under a Creative Commons Attribution-Non-Commercial-Share-Alike license. 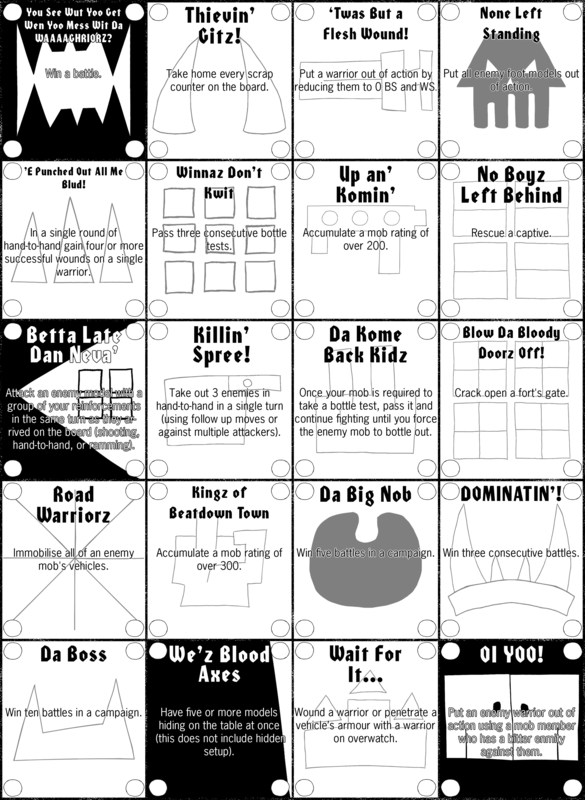 Yesterday we furnished you with rules for fielding Ork Klans in Gorkamorka, but today we have something even beefier written by Easy E.
Da Deff Islands is a rules supplement for Gorkamorka. This supplement was written for use in the Ammoriss Campaign for the Ammobunker web forum. Essentially Da Deff Islands is an entirely different setting to play Gorkamorka in, with battles fought in the ocean. If you ever felt like playing something more Waterworld than Mad Max, here’s your answer. If you’d like to read some battle reports from a campaign using Da Deff Islands rules, there’s a thread on WarSeer. This document was written by Eric Farrington. It’s licensed under a Creative Commons Attribution-NonCommercial-ShareAlike 4.0 International license. If you’ve got any feedback on them, there’s a topic devoted to them on The Waaagh. On November 6th Games Workshop are going to be rolling out their fancy new Dark Eldar models, which is rather timely as ScottM96 recently wrote a set of rules to let you field a mob of Dark Eldar in Gorkamorka. I wrote these rules not just on a whim, but because I was trying to entice a new player into Gorkamorka. He had just dropped quite a bit of cash on a new Dark panzee force and I didn’t want to have to make him buy Trukks and Traks (among other things) to start the game. Hopefully they are of use to some other GoMo players out there, and I look forward to adding some more to it (They are in need of Gubbinz). 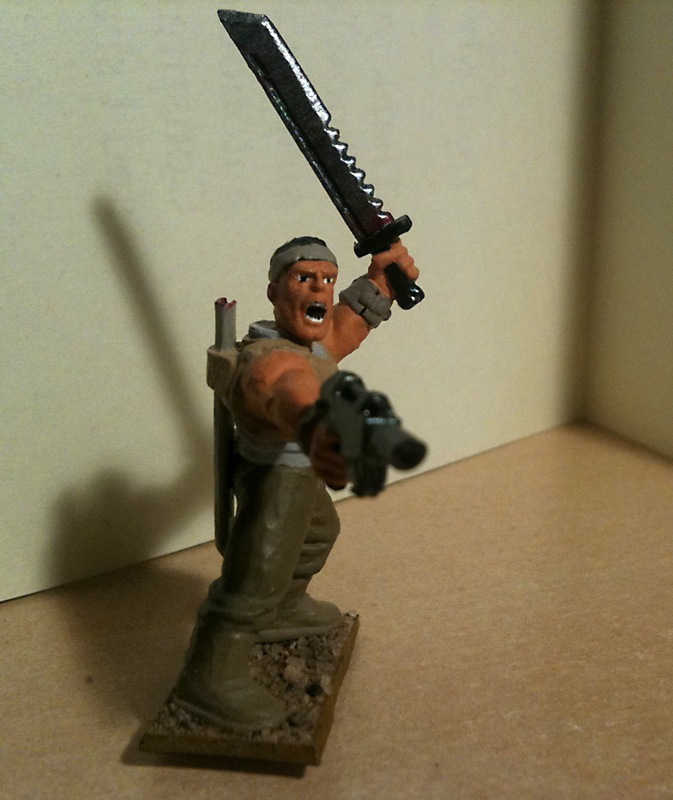 For those interested in more of my musings on GoMo, 40k and GW, visit my new blog: Da Slugger and Chopper. If you’ve got any feedback on the rules, questions, or comments, you can post them in his topic on The Waaagh. These rules are licensed under a Creative Commons Attribution-NonCommercial-ShareAlike 3.0 Unported license. Noshrok Grimskull has been in touch and shared some of the rules he used in his campaign of Gorkamorka detailing how a mob may hire squigs. As with most things the tUGS team writes, this document is licensed under a Creative Commons license, so feel free to share it. These rules and artwork are licensed under a Creative Commons Attribution-Non-Commercial-Share-Alike license. UPDATE – The finished version of these rules has been released. With the cessation of exams there has finally been enough time for Matt to finish a set of rules we have been using for a while for healing Muties. Muties have had a lot left out for what was supposed to be an extensive expansion of the game, one of which was the "Dok’s Serjery" table. No Mutie healing rules exist and the books explicity states that Doks never work on Muties. Given the huge cost of individual Muties, rebuilding even one lost warrior can take many games. So to aid the healing process, I present for your consideration, the bounty of the Cognoscenti: The Green Pits of Magod! These rules are licensed under a Creative Commons Attribution-Non-Commercial-Share-Alike license. Written by Jonathan Smith back in 1999 and appearing in Citadel Journal #31, here’s some rules for adding squigs to mobs. Featuring hopper squigs, nasher squigs, and hound squigs, it’s pretty comprehensive. There may well be other rules for squigs out there, but here’s a classic. Do let us know if you try them out, we’re keen to know how well they work. 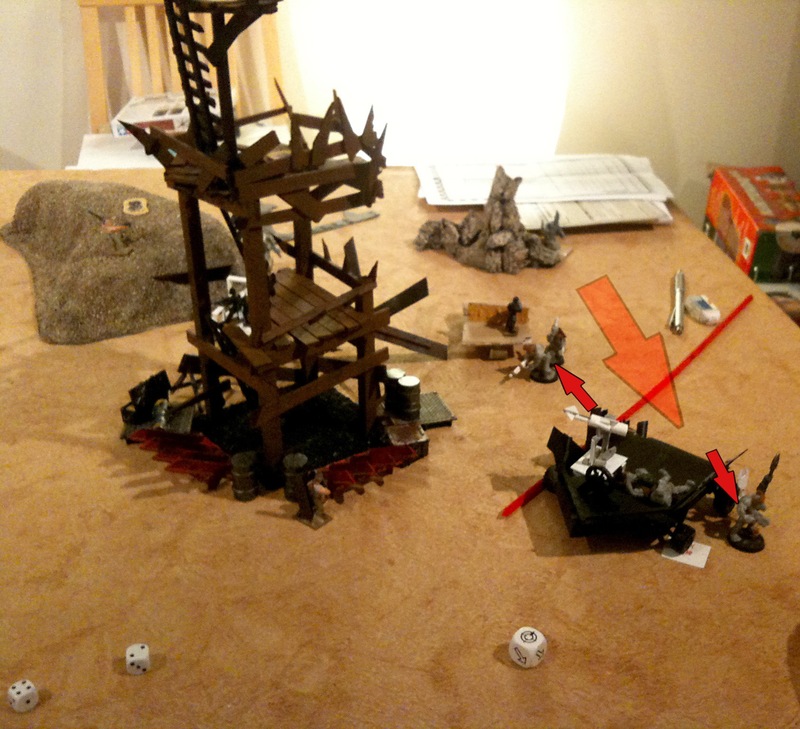 At the end of March we began playtesting of a new mob type for Gorkamorka – the Dust Rats. I’m not going to lay out all the details of the faction for now, mainly as it’s still being tweaked and refined, but work is in progress. We played We Woz ‘Ere Furst with the Dust Rats facing off against a mob of ork freebootaz (another ork faction, created by Neil Plews) and found a few interesting things out about the rules we’d created. You can read the battle report of the game here. First off, they weren’t hugely overpowered, or underpowered. This was of course a pleasant revelation as we were concerned that they’d be too good, although this is going to require more testing. Principally this is because the orks did not strike at their weak spots – hand to hand combat and pinning. Dust Rats, like Diggas and Rebel Grots, are vulnerable to pinning when shot at. This doesn’t apply when they’re on a vehicle, as far as we understand it, but when they’re on foot, firing a few shots in their direction will make them go to ground. We shall have to test this out a bit more to see how well it works, but at the moment this is one of their major Achilles’ heels. Secondly, apart from their Comanding Officer and Veteran, they are quite poor at Hand-to-Hand combat, with a starting WS of 2 for Grunts and 1 for Planks (ork boyz start with WS3, yoofs with WS2, if you need an orky comparison). Given how deadly melee can be, this can also be an excellent way to put Dust Rats out of action. Lastly, their basic vehicles have quite light armour and are therefore vulnerable to even normal shooting weapons, although not enough shots were fired for us to see whether the armour values that have been assigned are low enough. What we did find was that their ranged abilities were quite useful, particularly using overwatch and vantage points. This makes them distinctly different from all but muties, who themselves lack the ability to traverse tight spaces and climb. We are considering whether the long rifle (the veteran’s sniper rifle) should become move-or-fire, but this will require further games as it may just have been fortune in this case. 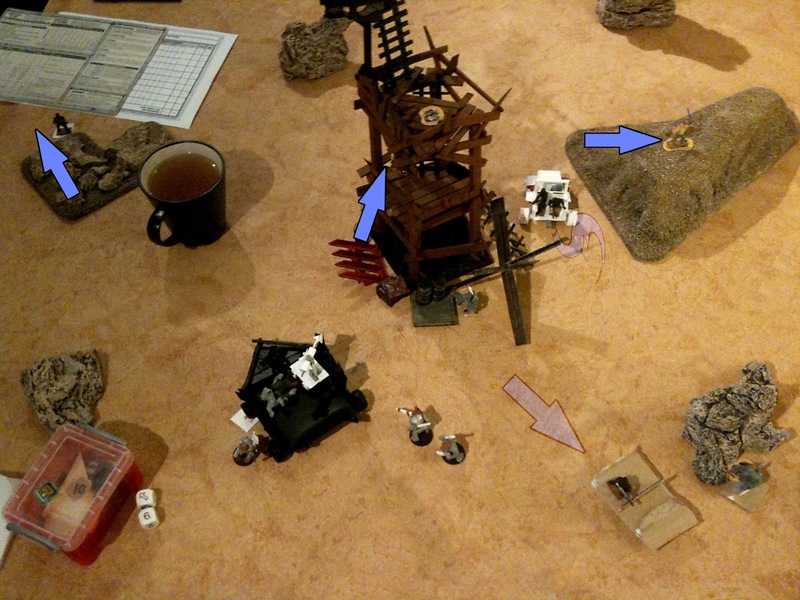 Speaking of fortune – the orks were incredibly unlucky during the game, so we may well switch the Dust Rat mob to another player and see how they fare against another mob of orks commanded by someone else. We now know that the basics aren’t too broken, but in the next game we need to see how the Dust Rats cope under fire, both against warriors on foot and their vehicles. We also need to know whether their WS is a sufficient disadvantage compared to their raised ballistic skill. In theory it should be, as shooting is not particularly deadly in GoMo (intentionally so, according to the game design notes at the end of Da Uvver Book). We also need to try out their other, heavier vehicle – the SSV. Its rules are still being discussed – it’s supposed to be significantly slower than most other vehicles, but it also needs to be able to work in Da Chase, so we’re not quite sure as to the specifics just yet. We also need to come up with a decent Dust Rat skill list, an equivalent to Da Dok’s Serjury, and any new gubbinz or items they will be able to purchase between games. Here’s some rules written by Tim “Majere” Peers, found here originally. We’ve not playtested them ourselves but feel free to give them a shot and let us know how it goes! Update: You can now get these rules as a PDF here. Weapons: You may arm the Nob with weapons and equipment from the Hand-to-Hand Weapons, Armour and Stikkbombz lists. Leadership: Your leader only becomes a fully fledged Nob once he has won a battle. His Leadership then rises to 8 automatically. Until he becomes a Nob your leader cannot attempt to buy custom jobs as the Meks refuse to deal with someone of such low status. Once he is a Nob other Orks make way for him in the street and don’t gob on him so much. Weapons: You may arm your Boyz with weapons and equipment from the Hand-to-Hand Weapons, Armour and Stikkbombz lists. Weapons: You may arm your Yoofs with weapons and equipment from the Hand-to-Hand Weapons, Armour and Stikkbombz lists. Toughness: Snorta Yoofs gain +1 Toughness when they get enough experience to become a Boy, just like other Yoofs. (Pale) Green Rider: Controlling a boar is difficult even for a full-fledged Snorta Boy- for a lowly Yoof it’s almost impossible! If the Yoof fires a shot from a pistol, or if a Stikkbomb goes off within 4″ of the Yoof, then roll 2D6. If the total is greater than the Yoof’s Leadership, then his boar will Run Amok! (See special rules) When he becomes a Boy, the Ork is no longer affected by this rule. Boarz: All members of a Snorta Mob ride ferocious War Boarz. Exactly where these unpleasant porkers came from isn’t clear, but just like Squigs they always seem to turn up wherever Orks do. 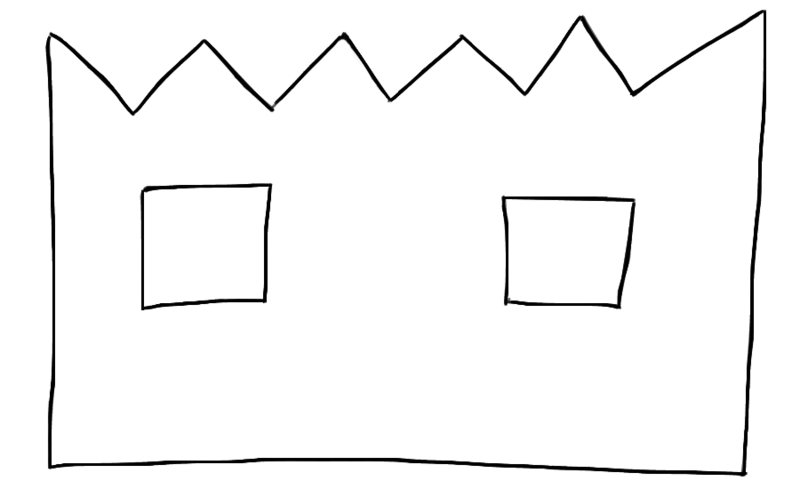 Movement: An Ork riding a War Boar moves at 7″. Snortas can charge and gallop in exactly the same way as muties, but since Boarz are considerably less co-operative than Mutie Beasts, Snortas cannot usually fire on the gallop, or set Overwatch. Snortas cannot hide. Shooting from a Boar: Snortas have a 90 degree fire arc to the front just like a footer. It usually takes an Ork at least one hand to keep his Boar going in vaguely the right direction, so Gunz may not be used from a Boar, except by Herderz. Shooting at Snortas: Shooting at a Snorta follows the same procedure as normal. If the Snorta moves at over 10″, there is an additional -1 to hit modifier due to the speed (and dustcloud!) Snortas are not driven off by enemy fire like Muties are. Close Combat: Snortas gain +1 Attack in close combat due to the viciousness of the Boar. (this is included in their profile) The close combat is otherwise worked out as normal. Picking up and carrying Scrap Counters: Snortas must stop for a turn to pick up Scrap just like Muties, they suffer no movement penalty for carrying it and may only carry one counter. Attacking Vehicles: Snortas do not dismount in battle. When they attack a vehicle they test initiative as normal, but do not board the vehicle. A Snorta who successfully attacks a vehicle fights a crew member as normal, but the crewman will only fall off his vehicle if he goes down, and the Snorta is simply moved out of contact with the vehicle if he loses, in addition to any wounds he may take. 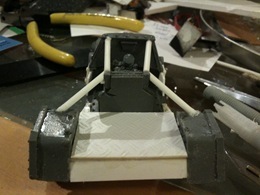 The vehicle may move away from the Snorta in its next movement phase as normal, but may not sideswipe the Snorta. Snortas and Forts: Snortas cannot climb fort walls, and therefore will need to destroy the gate of the fort to get in. Snortas count as footers when trying to get through holes in the gate. Rider goes down: A Boar automatically Runs Amok if its rider goes Down. If the rider goes Out of Action, the Boar runs away- remove the model as usual. Gets Bitten: Amok Boarz bite everything in sight, including other boarz. If an Amok Boar moves within 1″ of another Boar, then the rider must pass a Leadership test or his Boar runs Amok as well! Gets Rammed: Any attempt to Sideswipe or Run Over a Snorta will not be taken well. Once the attack has been resolved, the rider must pass a Leadership test to control his Boar, even if the attack missed or did no damage. Grabbin’ Scrap: Grabbing a Scrap counter means letting go of the Boar. Oops. The rider must test his Ld after digging up some scrap. If he fails, the Boar runs Amok, but the Scrap is still collected. Amok Boarz: An Amok Boar moves D6″ in a random direction at the start of each of its movement phases. If the rider is still active, he may not shoot- he’s too busy hanging on, shouting and hitting the Boar on the head! In the recovery phase, the rider may make a Leadership test, and if he passes then the Boar comes back under control and may move normally from then on. If an Amok Boar moves into an enemy model then the Snorta counts as charging and the Boar immediately comes back under control- it’s found something to bite! Amok Boarz also recover and fight normally if charged by the enemy. If an Amok Boar moves into the enemy whilst its rider is Down, then the rider is taken Out of Action and the model is removed. Amok Boarz will never attack vehicles- if its movement would move the Boar into a vehicle or other obstacle the Boar stops 1″ away. 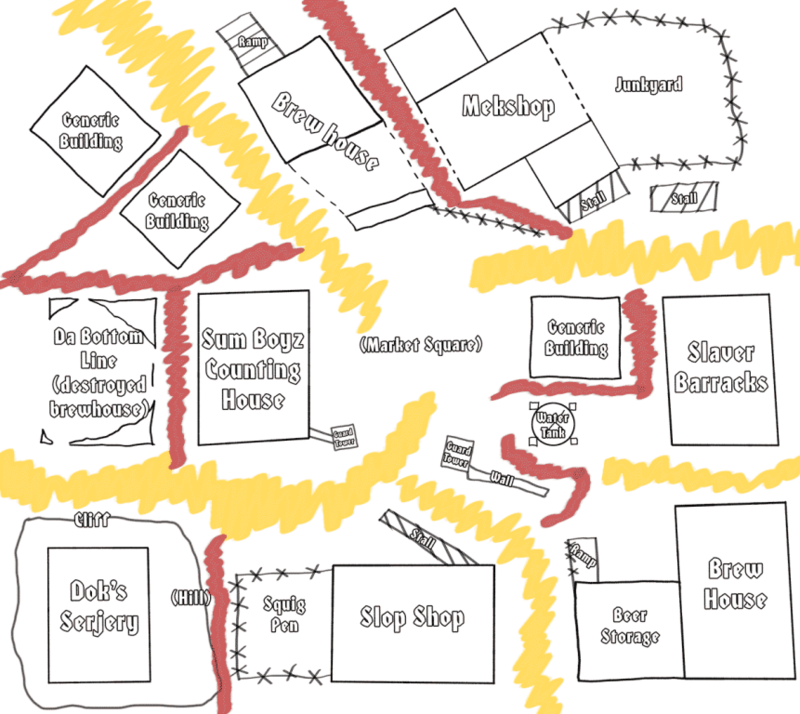 Snorta Scenarios: Snortas are treated exactly like a normal Ork mob when deciding which scenario to play. 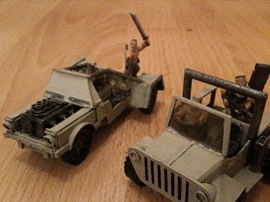 Whenever a scenario allows the use of a vehicle, the Snortas get two warriors instead, plus any extra warriors allowed. If attacking in Da Trap, the Snortas deploy in the same way as Muties. Serious injuries: Snortas take Serious inuries as normal, and may visit the Docs as normal. The only exception is with a Leg Wound- the Snorta is not slowed down because he’s riding a Boar, but he does suffer -1 Ld per Leg Wound when trying to stop his Boar running Amok- he can’t kick it quite as hard anymore..
De-Lux Kicking Leg: The warrior does not gain the Kick attack, but he does receive +1 Ld to control his Boar. (Kop dis, piggy!) This may take his leadership for the test above 9! The warrior also gains an extra 1″ movement in any Boar Race he takes part in. Telescopic Legs: The warrior’s movement is unchanged, but he can use his extra long legs to climb Fort walls (Boar and all!) or board vehicles like a normal footer if he wishes! Understandably, this upsets his Boar, and he must test to control it if he does not end his move in close combat. Gyro-Stabilised Monowheel/Tracks/Wheels: The warrior is no longer able to ride his Boar! He is subect to all the normal rules for the bitz, but loses all bonuses from the Boar. (Including one Attack) He is allowed to use Gunz now, however. Death of a Herder: If a Snorta mob ends up with too few Herderz, it’s bad news all round. The Boars won’t get fed or looked after properly, and that makes them mad! Until the mob has enough Herders again, every member of the mob except for any remaining Herders suffer from the Pale Green Rider rule like Yoofs! Boar Race: Who can ride fastest on a Boar? The Boyz set out across the desert to find out! Put the two Snortas side by side, and mark a finish point 48 ” away. Both Snortas move D6″ plus their Toughness towards the point simultaneously- first one there wins! If both Snortas arrive during the same move, then the whole thing degenerates into a Mounted Fight! Mounted Fight: The Boyz fight it out in close combat with all their ususual weapons and equipment. Neither side counts as charging. The Snortas gain experience for wounding hits as normal. Bucking Boar Riding: The Boyz are each lowered onto the biggest, meanest Boar the mob has, and someone gives it a hefty whack! Both Boyz struggle to hang on longer than the other one. Roll 5D6 for each Boy in the challenge, and count how many are equal to or less than the Boy’s strength. Whoever scores the most wins! If the result is a tie, then both Boyz pick themselves up and start the contest again. Note that the bonuses for riding a Boar are included. Gotcha! (Ferocity Skill) Re-roll this skill. Duck N’ Weave: (Cunnin’ Skill) Works as normal as if the Snorta was on foot. Tinkerer: (Odd Skill) Re-roll this skill. Fixer: (Odd Skill) Re-roll this skill. Back Seat Driver: (Odd Skill) The warrior has an exceptionally loud voice and intimidates Boars any chance he gets. Any Snortas within 6″ of the Snorta with this skill may use his leadership when trying to control their Boar. Expert Aim: (Riding Skill) Treat this skill as if it was Hipshoota (Dakka Skill)- the warrior may fire while galloping at -1 to hit. If the warrior has both Expert Aim and Hipshoota, he may fire at the gallop with no penalty. 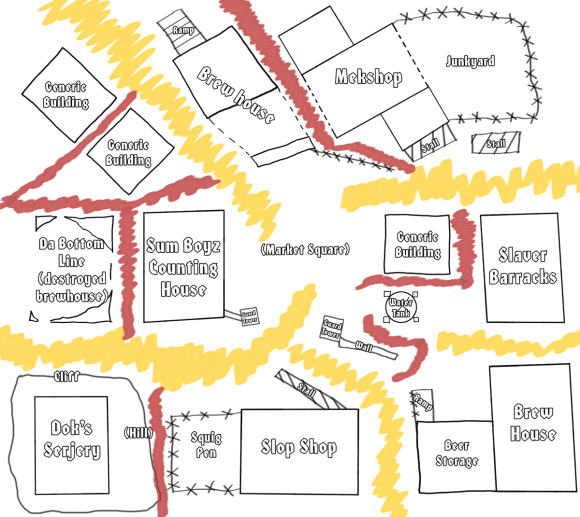 Snortas go to Mektown just like other Orks to get weapons Kustmised and warriors patched up. Snortas have no vehicles to Kustomise, but particularly brave Snortas may decide to take a Boar to the Doc in the hopes of creating one of the legendary Cyboars! A single Boar may only ever visit the Doc once, since Docs refuse to mess with each other’s work. The procedure is risky at best, but there are plenty of Boars to spare, so no-one gets too upset if the Doc makes a real hash of it. Replacement Boars cost 4 teef, and the rider suffers from the Pale Green Rider rule for the next game whilst he gets used to the new Boar. Does E’ do that often? The Doc has messed up badly. The Boar is so much spare ribs. The Doc has the decency not to ask for any teef for his work, but a new Boar will cost 4 teef. Down Boy! The Doc performs the Serjery and everything goes well, but the Boar wakes up before the Doc expected and goes berserk! Roll on the Kustom Boar table to see what happens to the Boar. The Doc demands D6 teef for the work, plus D6 more for the damage to the workshop. Job’s a Good ‘Un.. Waaagh da Doc! The Boar wakes up bang on schedule, and a new Cyboar is born. 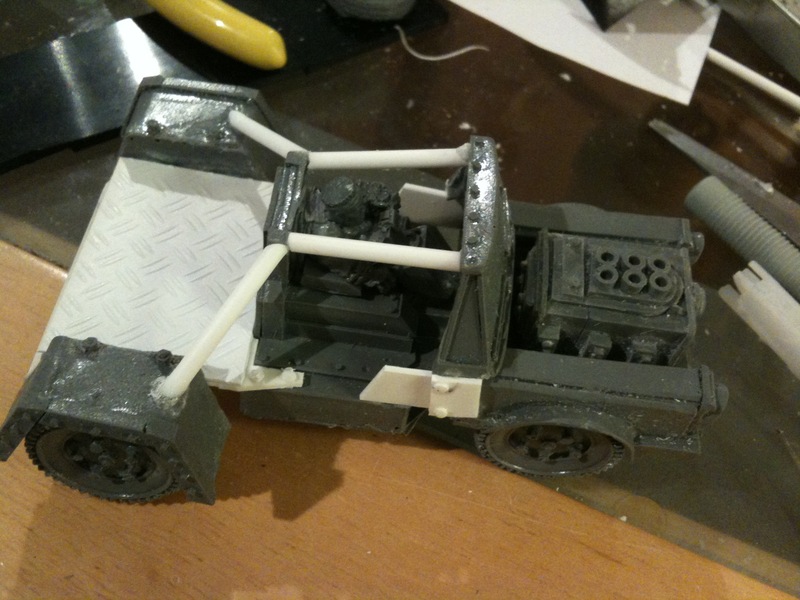 Roll on the Kustom Boar table to see what happens next…. Assuming all goes well, roll on the Kustom Boar table to see what happens next. Frankenboar! The Doc had some bits lying around, and used them. Then he borrowed some from the Mek next door. Then he took a few bits out….. The result is a deeply weird Boar! Add D6-3″ to the Movement of the warrior riding the Boar (this may reduce his movement) Re-roll this modifier before each game. The warrior gains +1 to his saving throw due to all the metal bits. Unfortunately the Boar has lost his edge a bit- the rider must pass a Leadership test to make the Boar gallop or charge. On the plus side, this Boar will never Run Amok. ‘Eavy legs. The Doc tinkers about with some De-Lux kicking legs to see what he can come up with. The resulting metal-limbed monster loses 1″ of movement, but gives the warrior riding it another extra close combat attack! Bikeboar! Vroom! The Doc has replaced the Boar’s rear legs with a Bike wheel, and added a hefty gas engine connected to the Boar’s digestive system. The resulting Boar lives in mortal fear of running itself over! The Boar gains +2 to its Movement, but may only cross difficult terrain at half speed. The rider suffers -1 to his Leadership when trying to control the Boar. Iron Head. The head of the Boar is totally rebuilt out of metal, making it look even more vicious than before. The Doc adds to the effect by ‘accidentally’ re-plumbing the Boars digestive system so it breathes smoke and hisses nastily. 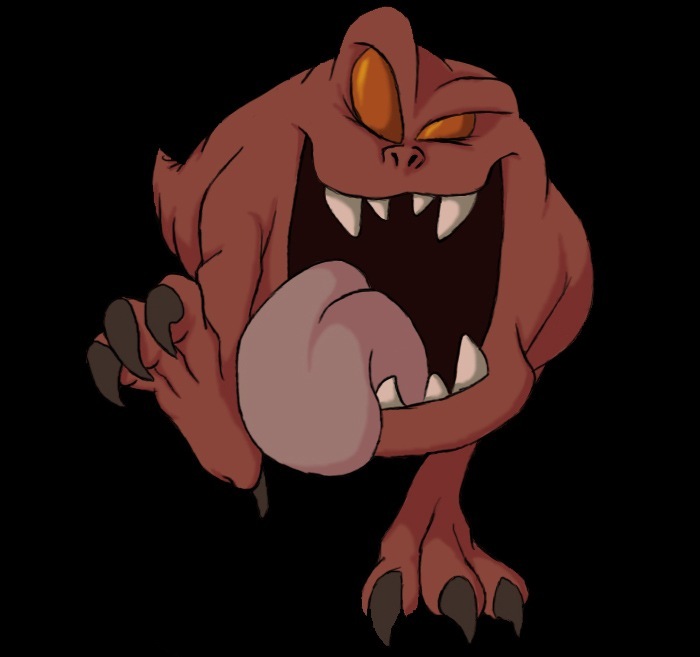 The resulting beast looks so evil that not only does it cause fear, but its owner must pass a fear test before each game to pluck up the courage to ride it! If the warrior fails his test, he may try again at the start of each of his side’s turns- when he finally passes he arrives on a random table edge. If the warrior is part of a reinforcement group he will arrive with the rest of his group if he passes his fear test in time. Fuel-Injection Implant. Delving deep into the Ork racial memory, the Doc fits a big, red button just between the Boar’s ears, connected to an extensive Fungus fuel system. The warrior riding the Boar can press the button at the start of any turn. The implant increases the Boar’s movement by 2″ and gives the rider an extra attack. Whenever the button is pressed, roll a D6. On a 2+ the Boar is fine and the implant works normally. On a roll of 1 the Boar gives a shrill squeal and dashes off over the horizon, carrying the hapless rider with it. The Snorta is removed as if he had gone out of action, and will suffer a serious injury on a roll of 4+. Total Rebuild! The Doc’s really done it this time. He’s only gone and completely rebuilt the Boar! The result is possibly one of the only War Boars on Gorkamorka with wing mirrors.. The rider gains an additional +1 save modifier for all the tough metal plating, and +1 Leadership because the whole thing looks so impressive. There’s also enough space between the ears of the Boar to mount a single Kannon or Shoota (which can be fired by the rider instead of other shooting, and may be Kustomised), although this has to be bought seperately. Unfortunately, the thing doesn’t always, er, start. Roll a D6 before each game- on a roll of 1 the Boar isn’t working today, and its rider must stay at home. This document was written by Tim Peers. It’s licensed under a Creative Commons Attribution license.